We slogged all the way back to town and got a cab. It took us back the same way, crossed the motorway at the circle a long way ahead and circled around to the visitor centre. That’s where and we got out and trotted up to the window and shelled out 15 bucks each. It was worth every bit of it, of course. This was Stonehenge, after all. You couldn’t come this far and not go in just because of taxi fare and a steep entry fee. Words can’t describe Stonehenge. Even pictures are of limited utility, though they are better than words. 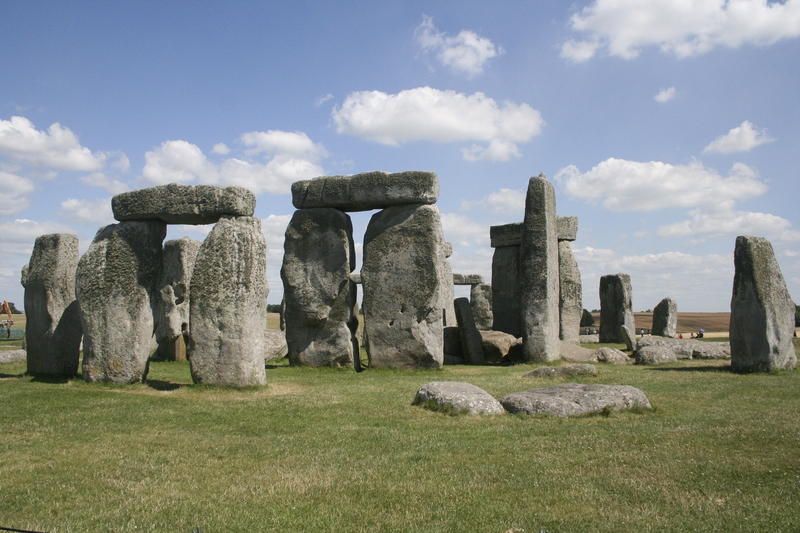 I’ve seen a thousand picture of Stonehenge, so in a way seeing it had no surprises. But as with the Taj Mahal, even though it looks just like its pictures, meeting it face to face is something else. We were determined to walk back. It was 6 km, according to GPS, which did show a walking route. We would not have to climb over the barbed wire fence or cross the ferocious motorway. It looked ok. At 5.45 p.m., armed with an empty bottle of water and no food (and not having had much by way of lunch either), we set out. Who needs food and water when you have determination? In 20 minutes, my determination turned to dust. 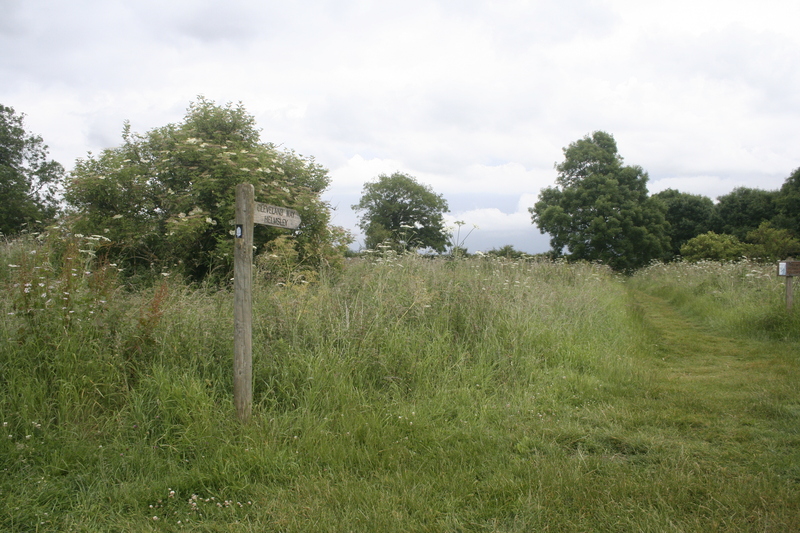 There was a footpath – for the first half km. After that, there was a narrow and weedy verge, for about a hundred metres. After that, it was just prayers and luck. It wasn’t a motorway at this point, but there were plenty of cars speeding by and my instincts said putting our faith in prayers and luck would not be a smart idea. We might have got there eventually and we might even have survived the experience relatively intact, but it didn’t look like it was going to be fun and I guessed that we would end up walking a lot slower than 3 km per hour and it would take quite a bit longer than two hours and by then tiredness and hunger and thirst and potentially even dusk would descend upon us. So we went back and called a taxi and what might have been an extremely memorable travel experience was nipped in the bud. I picked up a big bowl of kebab in town, mixed with salad and chilli sauce. This kebab is not what we call kebab in India. It’s the meat part of what we call a shawarma roll in India. In England, it comes with chips. Omitting the roll makes it gluten free. But I had had a lot of potato already and asked for just the meat, not realizing that the guy would give me enough meat to feed a cow. Oops. Ok, enough meat to feed an elephant. No, that doesn’t work either. Well, he gave a lot of meat. Hungry as I was, having survived the entire day on a single jacket potato and coffee for breakfast, I still struggled to finish it. At any rate, food in hand, we were back at the guesthouse by 6.30-ish. I spent the next three hours sitting at the garden table and looking out on the charming lawn, reading, writing, and sipping a bottle of beer. Mandalay was as pretty a place as I’d expected it to be, a small home tucked away in a corner of Amesbury. Amesbury was small enough to start with, perhaps not as small as Helmsley but in the same class. 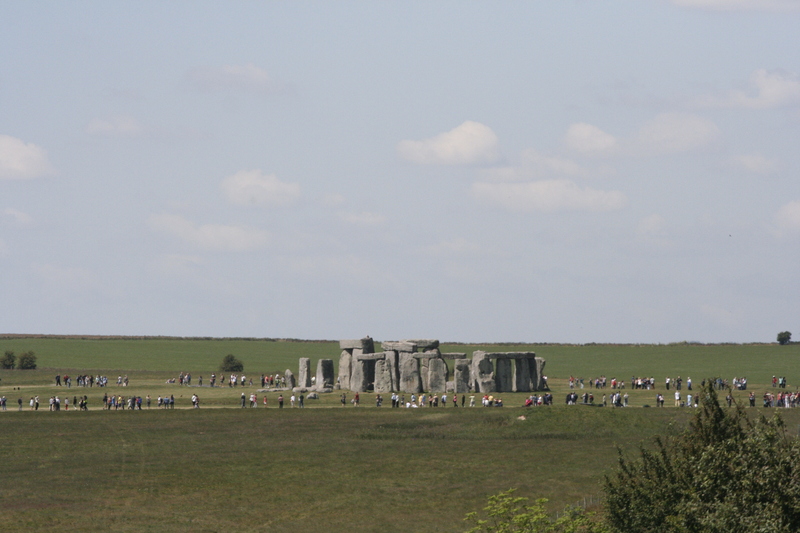 Mandalay was one of the last few houses on the road that led to Stonehenge and the motorway. It seemed to be a family run affair. Breakfast was provided, but no other food or drink, and there was no self service kitchen. The place was furnished just like a home, not hotelish at all. The furniture was all pretty, flowery stuff, and little bits of china decorated bookshelves, window ledges and the like. Every room was different and the rooms were named after poets. We were in the room called Wordsworth. The woman who greeted us was a little less than warm and friendly. In fact, when we first arrived around noon, she was quite curt in sending us on our way, since check-in opened only at 3 p.m. She did allow us to drop off our backpacks, though. When we went back in the evening, we met Nick, who was very cooperative and helpful. He showed us to our room, made a packet of noodles for Rajashree and handed out several bottles of sauce, and best of all, when I asked him if he would sell me a bottle of beer, he not only produced it promptly, he even waved away payment for it. What a sweetheart. 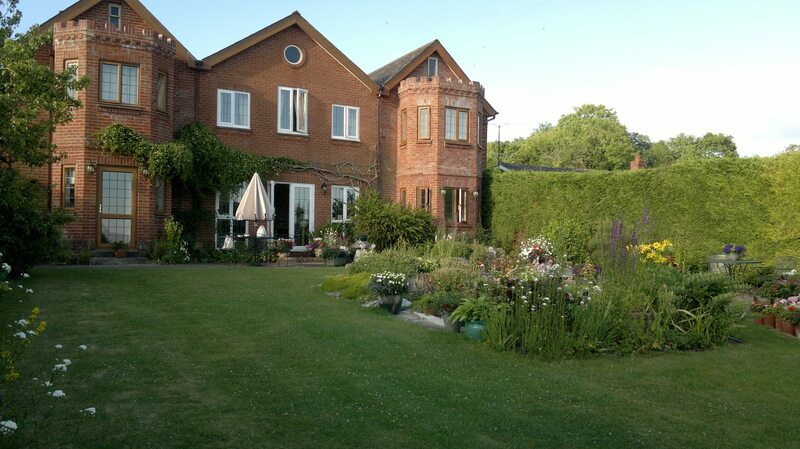 We had a fabulous room, a fabulous bathroom, a fabulous view of a fabulous garden, and a breakfast that was quite satisfactory. And so, well rested, well breakfasted, and generally quite pleased with life, we checked out on Friday to start our last day in England. I’d wanted to see Woodhenge, which was nearby, and which Nick said had pavements all the way to. 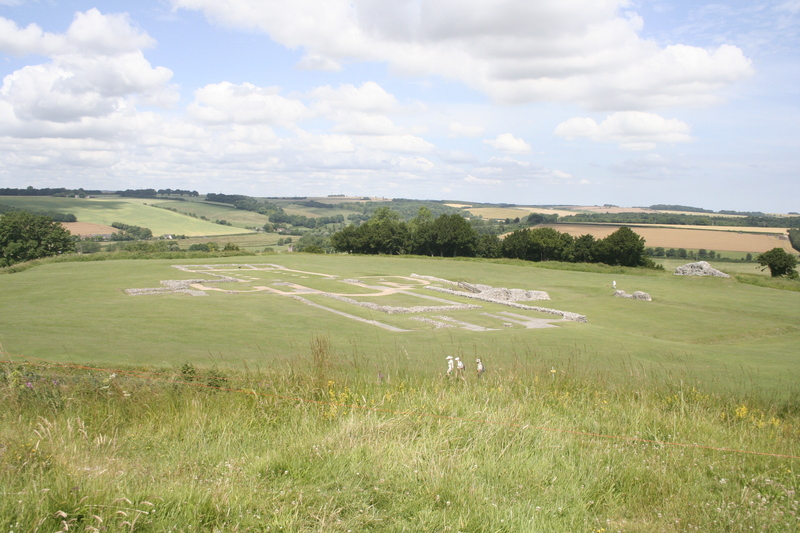 But Nick also said there wasn’t much to see and when I asked him about Old Sarum, he said it would be a better option. 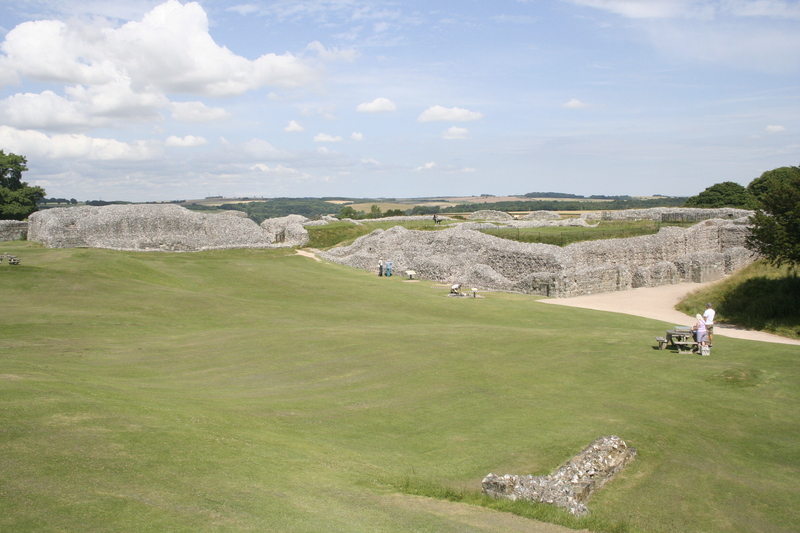 So we walked to the bus stop, got a bus to Old Sarum, and got off and walked up to this old hill fort. It was lovely! 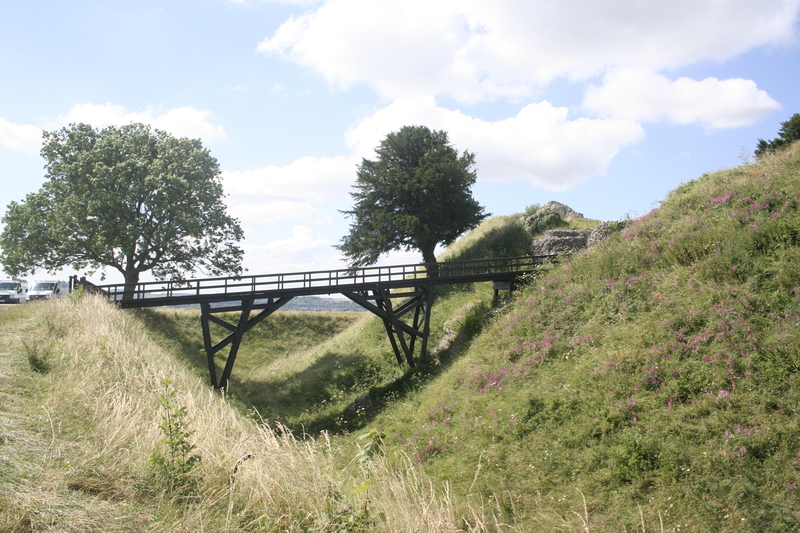 The hill fort was built around 1000 AD and abandoned and demolished sometime in the 1300s. (I think. Don’t rely on me for facts. If you really want to know, go look it up.) All that now remains was excavated in the early 1900s. Considering that what I had worked on last week was also an Iron Age hill fort, it was extremely interesting for me to see one that had already been excavated. Of course, ‘mine’ might have been quite different, but all the same. It would have been nice to have seen this before I went in my dig, so that I had some picture of the kind of thing we were working on. 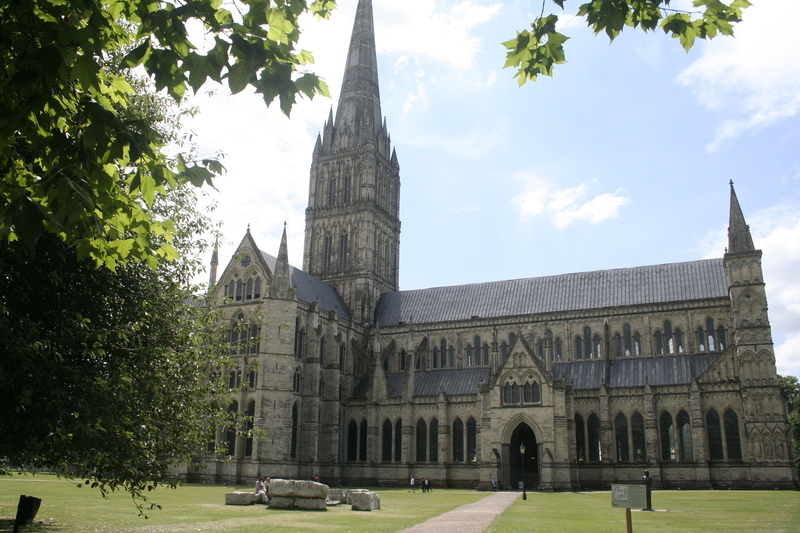 We went back to Salisbury and wandered around for three hours. The Cathedral was nice, though not spectacular. 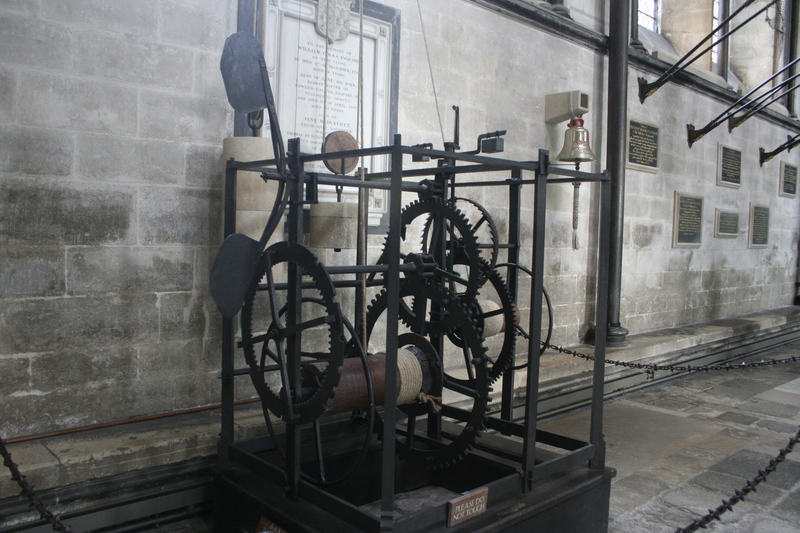 There was a medieval clock in the cathedral, built sometime in the 1300s, which has been restored and now works. The Reeve bakery in Salisbury was terrible torture. All manner of mouthwatering aromas wafted out and the views were no less appetizing. What agony to stand there and drink it in with eyes and olfactory but not be able to eat. It was almost as bad for Rajashree as it was for me, many of the mouthwatering items being non-veg and that too, beef. In the end, we both went in. I asked forlornly for gluten free stuff, but of course they didn’t have any. Rajashree was luckier, at least a few goodies were vegetarian. But I must admit, I did consider the ‘eat and be damned’ philosophy for a few seconds. Unfortunately, in my case at least, this gluten intolerance manifests in such a way, you eat for five minutes (if that) and are damned for two weeks or more, in which time the joy of whatever it was you ate is long gone and just doesn’t seem worth the damning. And so I bought sweet Williams pears for one buck and feasted on them all the way back to London. Such are the joys of a gluten free diet. There wasn’t time to do much in London when we got back. We collected our luggage and went to the other Youth Hostel, since the Noel Street youth hostel had no beds for us. Then we walked out and all the way back to Oxford Street and spend an hour wandering the narrow lanes of Soho. I bought a big box of kebab at the same Lebanese place we’d been to a few days earlier, and took it back to the youth hostel with me. It served for both dinner and the next morning’s breakfast. It was a warm night, made extremely stuffy by some bright spark in the room actually closing the window. I think all the buildings are made to trap heat and the windows open just a crack. It was so stifling that I woke around 4 a.m. sweating. I opened the window and stood there a while to cool off, and then by the time I was refreshed enough to go back to sleep, the night was over. And there was nothing more to look forward to except the long, tedious flight back home. This time, unlike many other trips to other places, I felt satisfied with my holiday. I’d known that sightseeing in England in one week was pretty much an exercise in frustration. I had only a sketchy agenda and I didn’t manage to see even all that was on it. Many, many highly recommended options just didn’t get done. Amit wanted me to see Wimbledon. Rajashree wanted to see Bath. Others had recommended Cornwall, the Lake District, the Tower of London from the inside, Westminster Abbey from the inside… I myself had wanted to see Oxford University and Canterbury. At least. (Without talking about Scotland and Wales and…) So, definitely, whatever I had seen was just the tip of the iceberg. The thing is, I’d known that even before I left home, even before I started planning the trip. At the end of every journey, all you are left with is memories and photographs (and a big hole in the bank account, but that doesn’t matter). Photographs, though, capture only what you saw, and only a small part of that. Yet, the travel was never about that at all. It’s about the experiences: what you felt, whom you spoke to, what they said. It’s about such fleeting things as impressions and emotions, things you experience but can never capture or hold on to. And that’s why I came home satisfied. There’s much I haven’t seen and as always – I might never see; I might never go back to England. But I have the experiences, I packed in as many impressions and emotions as one can hope to experience in two weeks’ time, and that’s what matters. It might even be all that matters. You’d think that after all the drama of getting to Helmsley, getting away would be easy. It should have been, because we started working on it even before we were shown to our room. In fact, after the very helpful woman at reception had spent the best part of the evening trying to figure it all out, it appeared to be sorted. We had an early morning bus that would get us to Haxby, and from there there would be a couple of local buses that would get us to York in time for our 9.45 departure on Wednesday morning. Thus reassured, we went our merry way on Tuesday. Helmsley was far and away the loveliest place I stayed in during the entire time I was in England. It was a pretty little place, too large and comfortable to be a village in Indian vocabulary, but perhaps a village for the English. The YHA youth hostel there was absolutely wonderful. It was a warm and cozy little place, prettily furnished, with a spacious and well endowed kitchen for guests, a bright and lively dining room, a TV room for the football fans, toys and books for kids, books for adults, and of course dorms, toilets and showers. Everything was sparkling clean and extremely welcoming. It was so cheerful and warm that you really couldn’t help making friends with the other occupants and I think we chatted with almost everyone else who was staying there. Helmsley a single road kind of place. One road, one square, one church. There were a few restaurants, all of which seemed to close at 5 p.m, except for an Indian restaurant run by a Bangladeshi that was still open at 8, when we went looking for dinner the first evening. He was quite amazed to see us two Indian women there and wanted to know what we were doing there. At any rate, he served us our first and last Indian meal of this trip and fairly mediocre it was, too. The next morning, while we were wondering aloud what to do for the day, we got not one but two separate offers to drive us up to Riveaux. 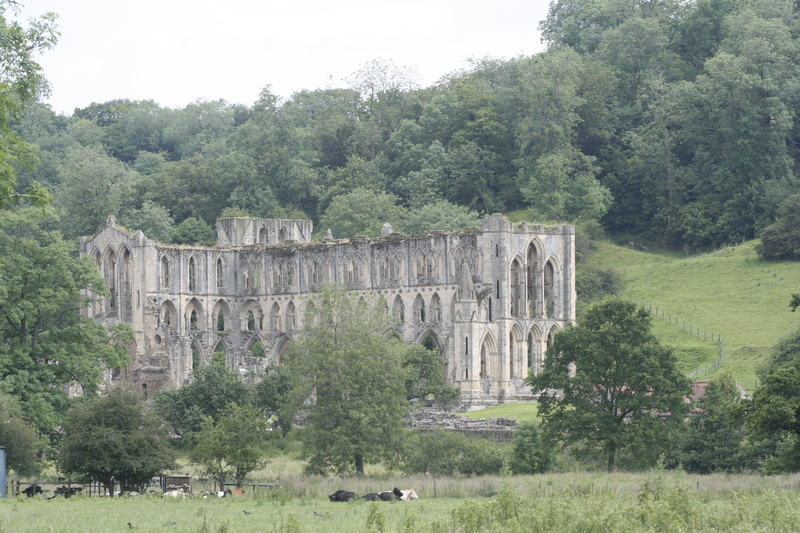 This is a ruined Abbey about 4.5 km away and there is no bus that runs in that direction. I thought it was a bit far to do the round trip on foot, but a one way trip was definitely doable. So we jumped at the first offer, and by 10.15 a.m we were at Riveaux Terrace. The Terrace entry fee was about 6£ and it would open only at 11, two very good reasons to give it a miss. We took the forest footpath down to the village and followed the road on to the Abbey. 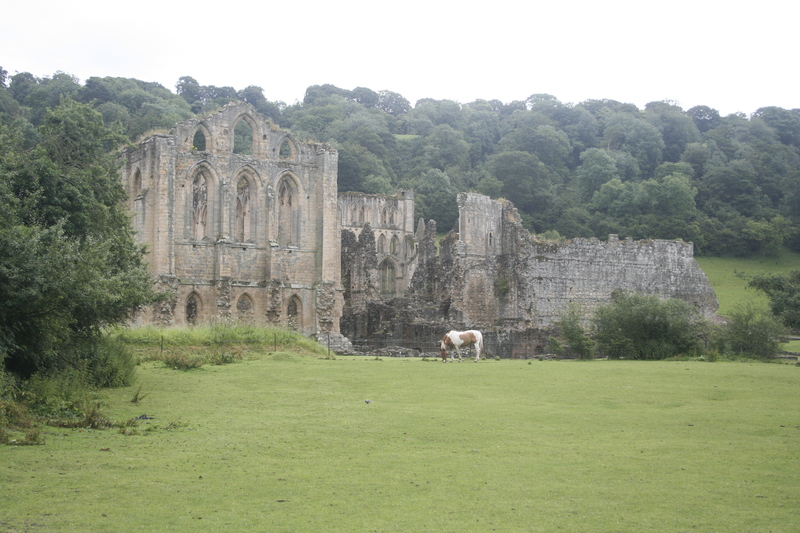 The village itself was impossibly idyllic, the Abbey no less so. One part of the ruins is visible from outside. You could pay the entry fee and examine the rest of the ruins, but we just walked around the outside and took lots of photos for free. 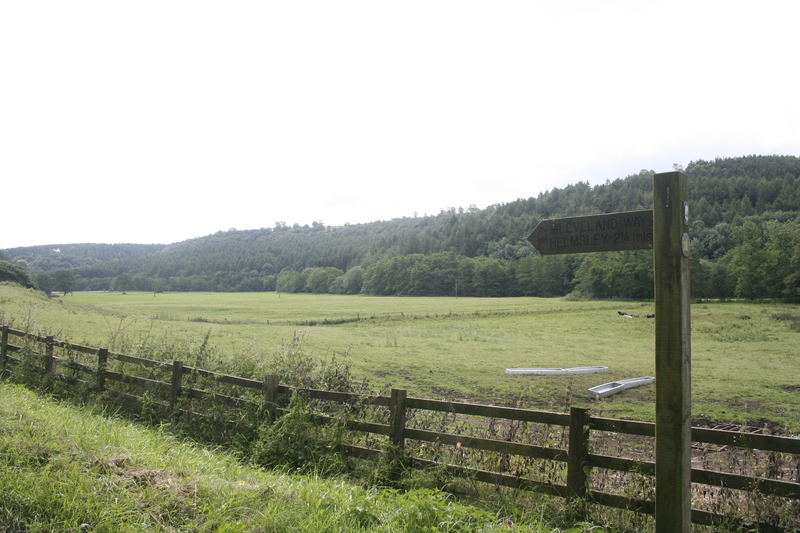 And then we followed the neatly signposted footpath for 3 miles until it led us back to Helmsley, just in time for lunch. 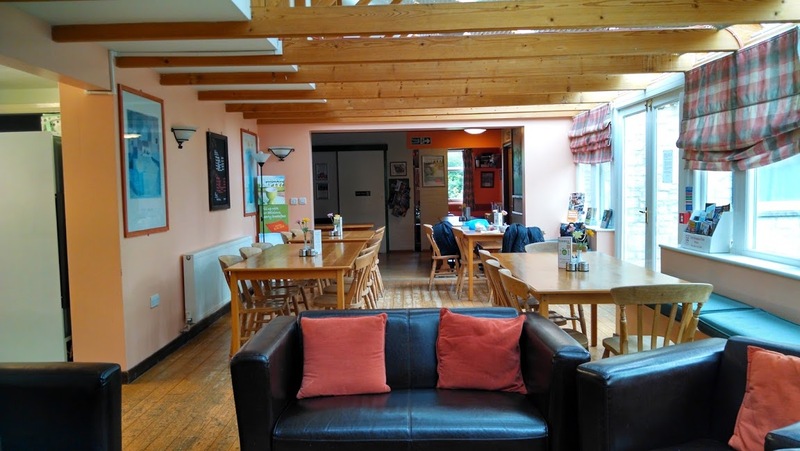 We had a quiet lunch back in the youth hostel, which was quite deserted. It was 4 p.m before I decided to venture out again, looking for the castle. It occurred to me that I should check the bus stand in the square to verify that the bus to Haxby would indeed leave at 7 a.m. But naturally, I went to the castle first. So it was past 5 p.m when I finally discovered to my shock and horror that there was no such bus at all. It had been discontinued. The next couple of hours whizzed by as we considered our options. Finally it turned out that the only sensible thing to do would be to take a taxi to the nearest railway station, Malton, and from there get on a train to York. Our youth hostel had no wifi, so all the arrangements had to be done by the woman at the desk, who got through it all with unflappable patience, while also handling her other duties. As always, these little obstacles caused inordinate amount of stress and hassle. Would National Express change our tickets to a later departure from York? Well, they would, but it would cost 47£. 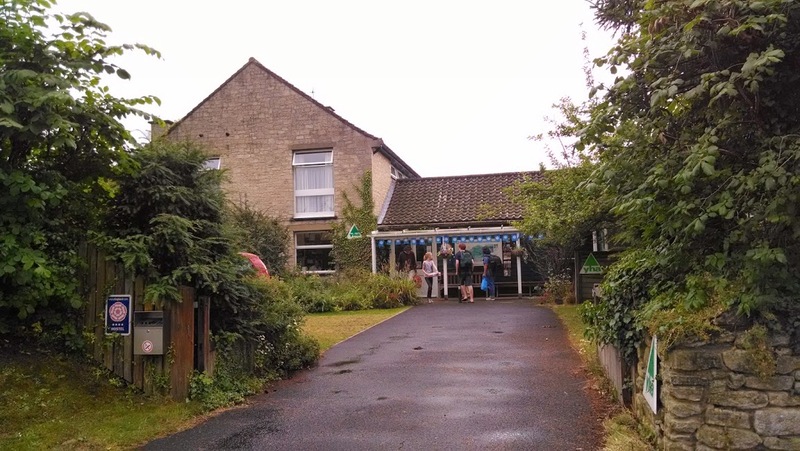 Should we take the 5.45 bus out of Helmsley this evening, throwing all our stuff into our sacks and running to the bus stand in 15 minutes flat? Well, we could, but then what would we do overnight in York without a booking? 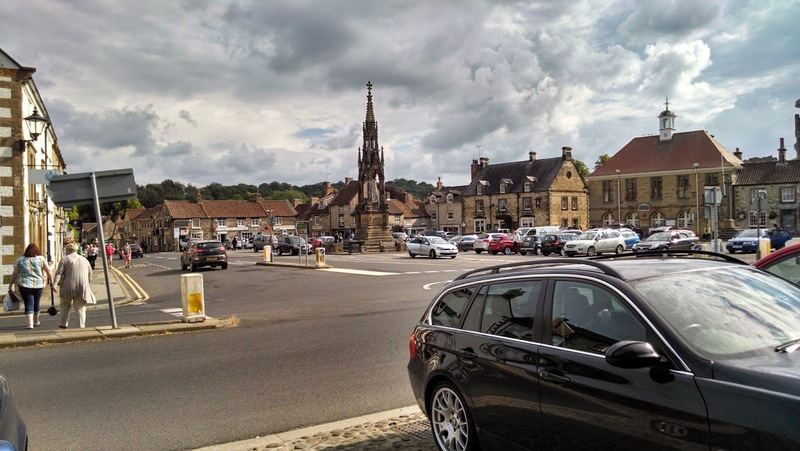 Should we take a taxi to Easingwold instead of Malton, and then wait for a bus to York? Or should we take a taxi directly to York? What would it cost? How far away was everything? Could we walk? As we pondered all these things, a man entered the lobby. He must have been over sixty, lean, dressed in running or cycling clothes, and panting slightly. He had cycled to Helmsley in two and a half hours, he said. From York, of course. Well, that wasn’t much help. We didn’t have our cycles with us. If we had, we would have cycled too. Of course. At any rate, the next day, all went as per plan. Our taxi arrived only 5 minutes late and the ticket counter was in fact manned and we got our tickets and got on board the right train and got off at the right place and even managed to walk in to town and grab a delicious hot breakfast of jacket potato and coffee before getting on the bus to London. We still had nothing for breakfast when we woke up in Newcastle the next morning. At 7-ish, we went out once more looking hopefully for a Tesco that was open, and this time we found it. By the time we’d bought stuff and got back to the youth hostel and were ready to leave, it was just past 8. We had a bus to catch at 8.30, and the bus stand was a good 25 minute walk away. We rushed… And made it, but only just. 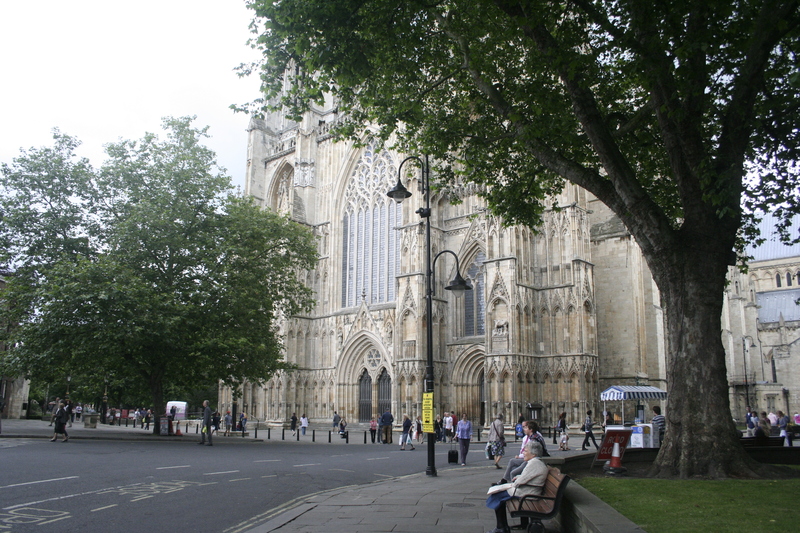 We arrived in York at 11.30 on a lovely Monday morning. We had missed the Tour de France by just a day, but York was still festive. There were hordes of tourists out with cameras slung around their necks and the sun was obligingly doing its bit to add to the festivities. We walked and wandered and roamed and lingered and took photos and even had ourselves a cup of afternoon tea and coffee. Rajashree was thrilled because we found Harry Potter’s Diagon Alley and a sweet shop that was just magical on its own merit. I tried liquorice and decided the kids wouldn’t like it, but I also went into every chocolate shop I saw and ended up buying two dark chocolate frogs for the kids. 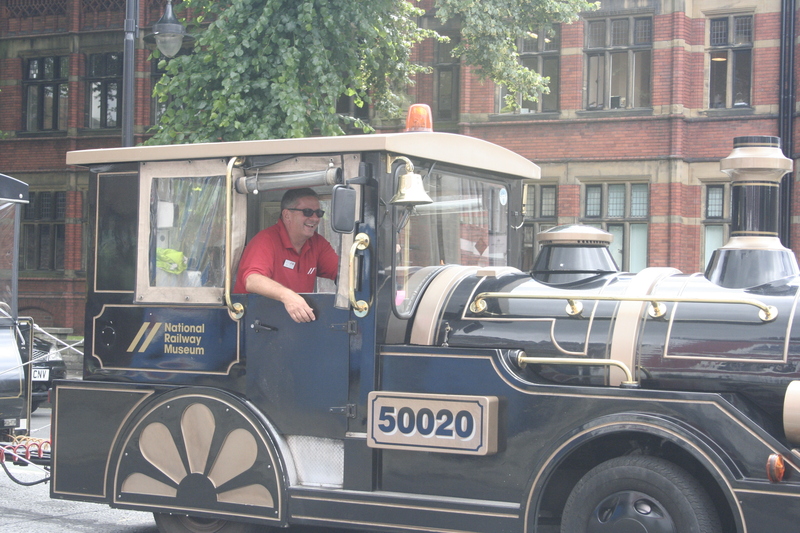 There was this little toy train thingy that took people around York. I wasn’t in the least bit tempted to get in it, but it was worth a quick photo. Then the driver called out to me, “Do it again. I wasn’t smiling.” What can you do when people and friendly and cheeky and sweet like that? I took another one. As an aside, I was on a bus and munching on an apple. When I was done, I glanced about for a trash can – most of the long distance coaches have one. I didn’t see one, so I went to check with the driver. You know what he said, as I walked up to him brandishing the thoroughly eaten apple core? “No thanks. I just had lunch.” (Or words to that effect.) People were cheeky like that all over the place. It was nice. 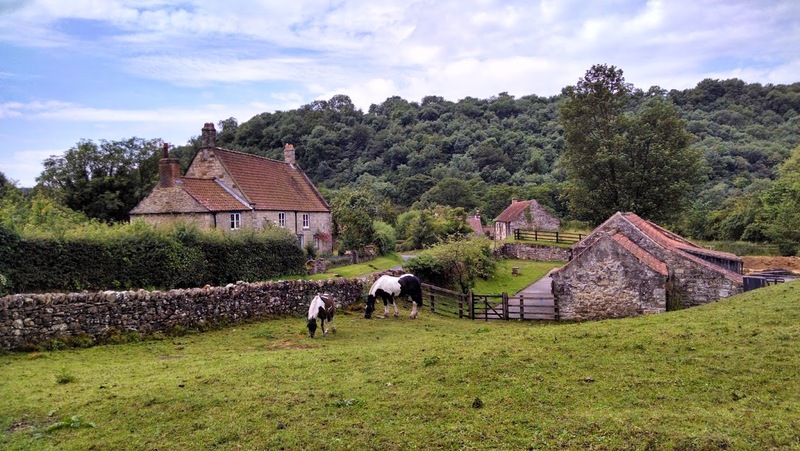 Around 4.30 p.m., we decided it was time to find our way to Helmsley, where we were booked in the youth hostel for two nights. 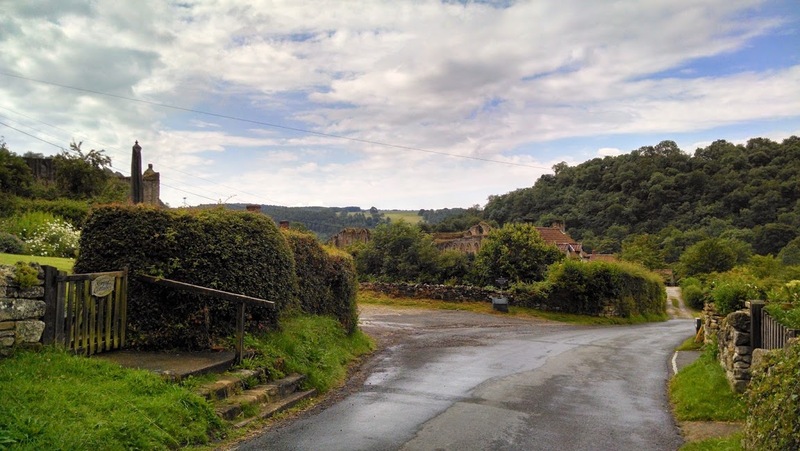 By 5 p.m. we had found our way back to the bus stand… Only to discover that we had missed the last bus to Helmsley by a few minutes! What to do? We frantically rushed in to the railway station behind the bus stand to find other routes to Helmsley. To no avail. The bus information counter closed at 5. There were timetables available, but when we finally found the ones we wanted and deciphered them, they only said we were out of luck. The last bus to Helmsley from anywhere had either already gone, or would have gone by the time we reached its junction on some connecting bus that was yet to arrive. Of course I didn’t have the youth hostel number on the sheaf of printouts that I’d brought along. If Amit had been with me, he would have certainly had it. If he had been with me and I hadn’t had it, I would have certainly got an earful. But me? I was blase. Phone numbers can be easily found on the internet. Both our phones were being quite erratic. At that moment, my phone was working to make and receive calls, but Internet was not working. Thankfully, Internet was working on Rajashree’s phone (but, oddly enough, she couldn’t make calls). She found the YHA number online and I called them, rapidly eroding the meager balance on my pay-as-you-go prepaid card. The Youth Hostel guy said, take the train to Scarborough then take a bus in Pickering direction, then get off at Helmsley. Unfortunately, though, this was not exactly the Youth Hostel at Helmsley that I was speaking to, it was a Youth Hostel helpline, I gathered. They were only getting information off the net – from google maps, quite likely. So they had generic information, like distances and journey times, but they didn’t have the sort of information that a local would know. Like, for example, what time there would be a train to Scarborough from York, and what time the last bus from Scarborough towards Pickering would leave, and whether or not the former would get us to Scarborough in time to get on board the latter. Today. Before I could finish this intriguing conversation, a bus arrived. Rajashree went to question the driver, while I listened with one ear on the phone and the other on the bus driver. He said that the bus would go to Pickering. Hearing a familiar name (the guy on the phone was saying Pickering only seconds earlier) I was all for getting on the bus and going as far as it would take us. The chap on the phone had said that getting to Scarborough would take 49 minutes and the bus to Pickering would take an hour and a half. If we had a bus that would get us directly to Pickering, it sounded like a good idea. However, the driver of the bus was kind enough to make a call (these buses have a phone on board), at the end of which he told us that by the time we reached Pickering, we would have missed (by about five minutes) the last bus from Pickering towards Helmsley. So basically, by about 7 p.m. we would be stranded at Pickering, a mere 10 miles from Helmsley. Too far to walk. Taxi? I asked, tentatively. The driver shook his head and said it would be very expensive, but he couldn’t venture a guess as to how expensive it might turn out to be. Rajashree was all set to spend the night in York. I pointed out that we had no bookings and that we might have to sleep in the railway station. 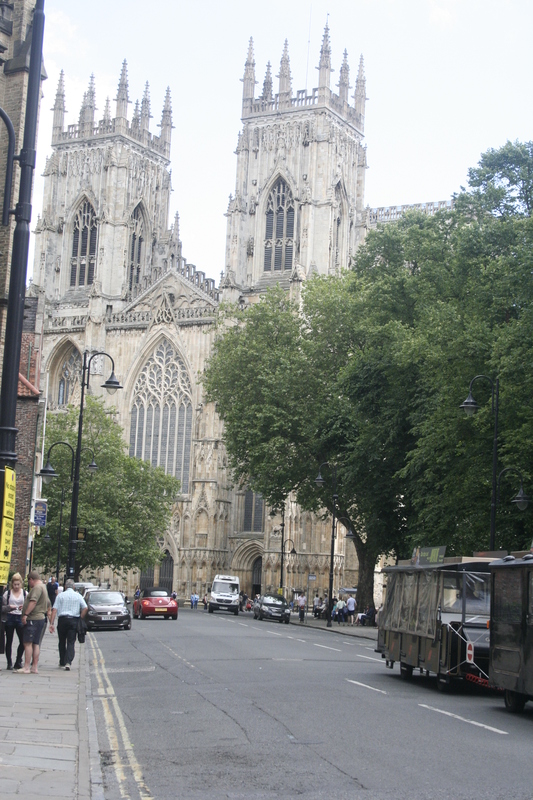 We both hesitated, unsure whether to jump on to the bus that had waited so patiently through all this, or to step back and take our chances in York. I had just decided that we should go and asked the driver for tickets and was still reeling from shock at the prospect of shelling out £8.80 just to get to an unknown destination with no real prospect of getting to our reserved hostel tonight, when things took a really unexpected turn (as they often do, I find). Well, we were just completely amazed. Of course we accepted, and with alacrity. What was even more amazing was that this woman lived nearby, and she told the driver to give us tickets to her stop, which turned out to be only £2 each! Of course it was incredibly sweet of anyone to go out of their way to help us, but I thought perhaps she was going that way anyway and it wouldn’t be too far for her, maybe a ten minute drive or something. Helmsley is only 27 miles from York, so it’s not exactly far, and we were going to go part way on this bus. But the truth was quite extraordinary. Rachel, a very pretty young woman, was an actress just back from a five week stint in the US. She lived with her boyfriend in Birmingham (or somewhere) and was coming home to meet her parents after a gap of several months, I gathered. When she reached home, with us in tow, her parents came out to meet us, and it emerged that there was a big dinner planned, which now, of course, Rachel would miss entirely. “Keep some nice food for me,” she said cheerfully to her mother as she opened her car. It was no ten minute drive either. It took a full 45 minutes one way and it was almost exactly 7 when we reached. Helmsley was way out in the countryside, along a long, deserted, curvy, up and down country road. The route had signposts all along, but I kept the navigation on as well (which was actually working! 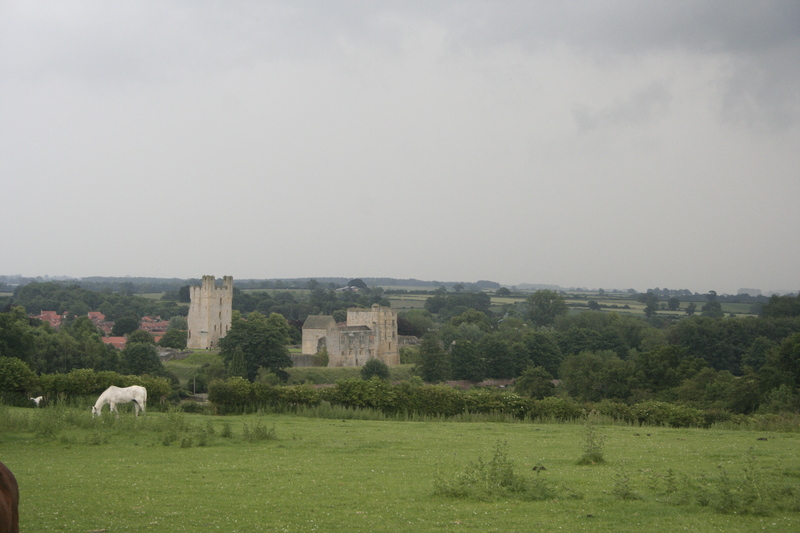 ), so that when we reached Helmsley we would have no trouble finding the place. Navigation worked well and was certainly helpful at one place where there were no signposts, but Helmsley itself offered little opportunity to get lost. 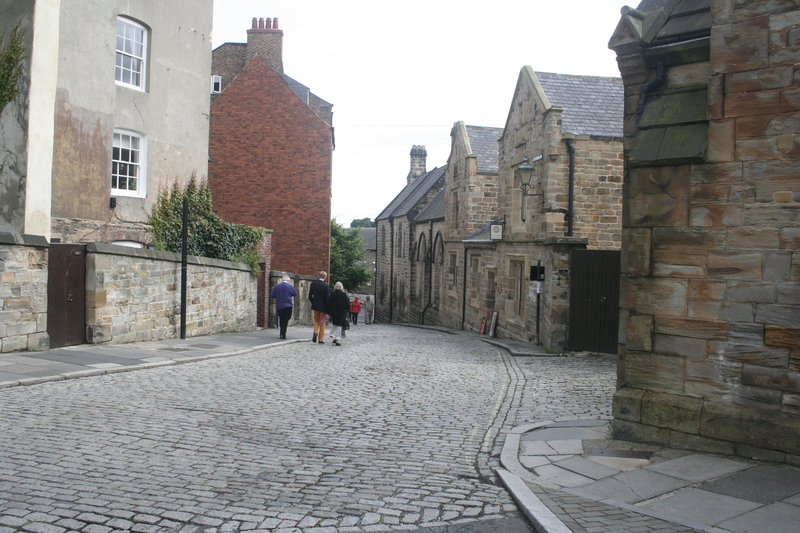 It was basically one main road, one square, one church and a few very pretty little houses. What can you do when someone is so nice to you and goes so far out of their way to help? In what way can you thank them or repay the kindness? Rajashree wondered if we should offer to pay, but I felt that would not be right. Such spontaneous acts of kindness cannot be measured in mere money. Rachel herself explained that it was no trouble at all and that she understood what it was like to be in a spot of bother while traveling. She told us how she had suddenly been stranded when her friend lost her mobile phone and wallet at a bar in New York City, and how a stranger found it and kept it and returned it to them. I understood… She was paying it forward. The best way to thank the world for such random acts of kindness is for us to pay it forward too, whenever we can. We chatted all along the way to Helmsley and Rajashree spared no effort in building up my celebrity status as an author. So it didn’t seem too presumptuous to offer one of my books to Rachel at the end and she was happy to accept the one on adoption. It wasn’t enough of a thank you for helping us out of a tight spot, but it was better than nothing. All through the drama, Rajashree and I kept thinking of what our respective husbands would have to say when we eventually told them all of this. 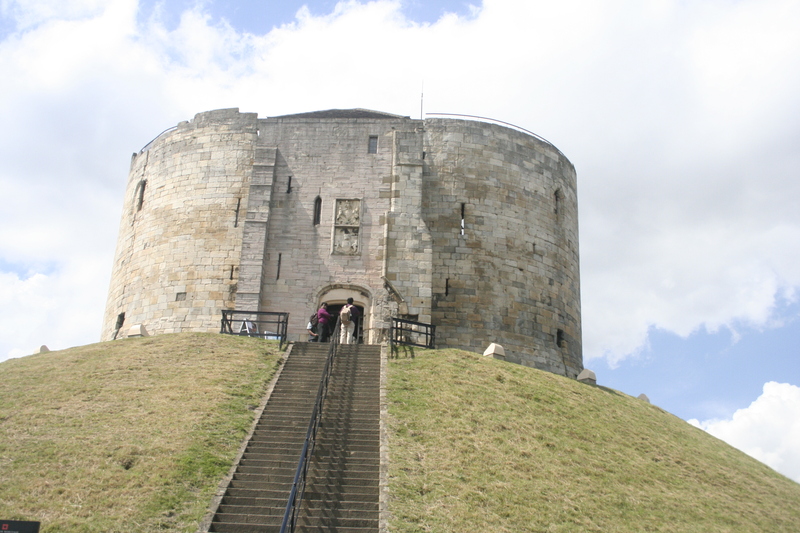 Of course, it was entirely our fault for not having checked the bus schedule when we reached York in the morning. It was also stupid of me to not have the numbers on hand – though at least we easily found that out online. But all that drama could have been avoided by just checking the bus schedule as soon as we got in. You’d think I would know better. On the other hand though, if Ihad done that, it would have made for a very bland and boring travel experience, don’t you think? And I would never have met such a lovely person or come away with such a strong reinforcement of my generally rose-coloured-spectacles view of the world. 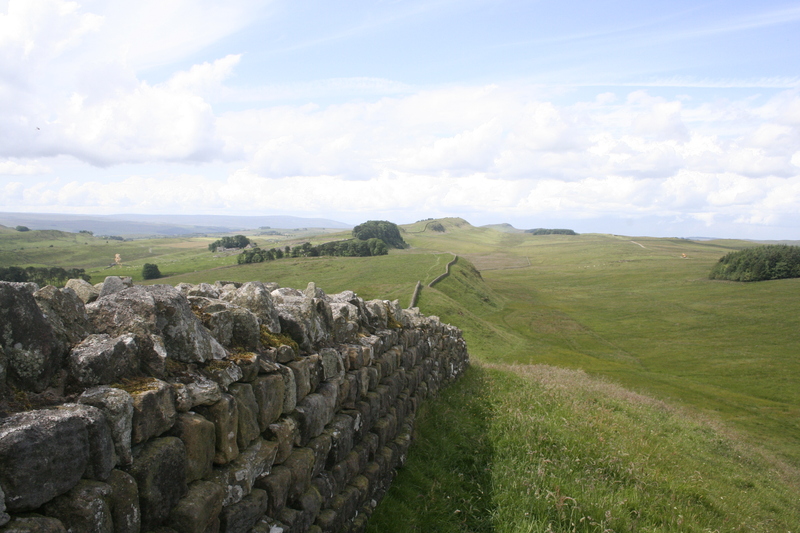 The next day was for my dear friend, Hadrian. The Emperor, I mean. The guy whose villa I have visited a couple of times in Italy. He had a bit of a wall in England, I’d heard, and I thought I’d go and look him up over there, just to say hi. My original plan was to do a walk. 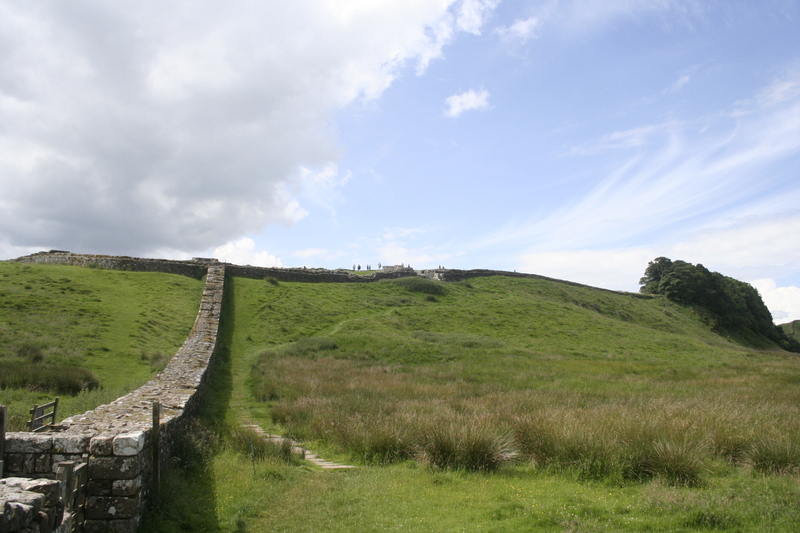 The trail I’d chosen was from Housesteads to Housesteads, taking in several milecastles and the fort at Roman Vindolanda along the way. It was supposed to be 7 miles or so, which sounded eminently doable. I’d met up with Rajashree at Newcastle when I got back from Durham. She was coming from a week at London and Edinburgh. We spent the evening talking and doing laundry. The laundry took ages – partly because we started by putting the clothes into the dryer and then wondering why it wasn’t washing and deciding we’d just leave it to do its thing and wandering off for an hour to chat and have dinner. When we got back and found everything dry as a bone, we were delighted – until someone asked us if we were done with the dryer. Well, we put the clothes into a washing machine after that and wandered off again, and when we came back an hour later, they were done but sopping wet, so we took them out and put them in the dryer again. But this time, no matter what setting we tried, the damn things just didn’t get dry. After a couple of hours we gave up and went to bed. By that time, it was past midnight. We’d intended to step out and buy something for breakfast the next day, but what with the laundry and the dinner and the chatting, we just didn’t get around to it. 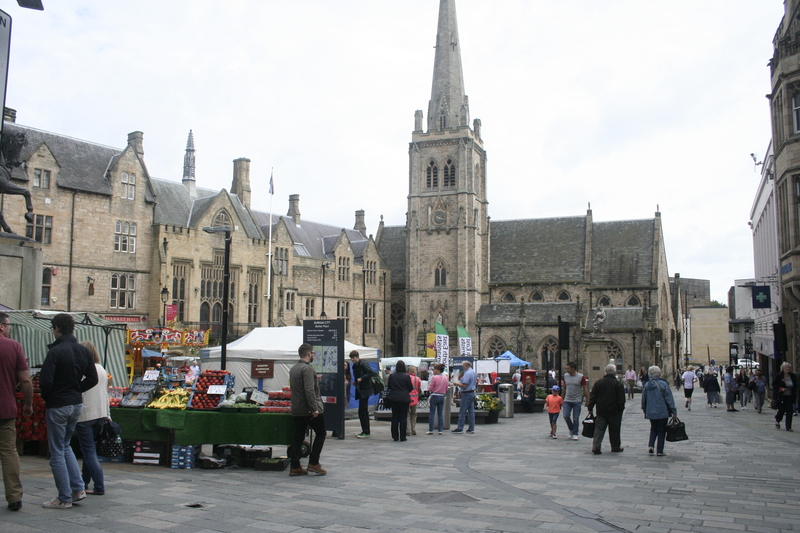 We got on a bus to Hexham and at Hexham we wandered around looking for food. It was only 7.30 a.m and a Sunday to boot, so all we really got was a bottle of water. Then we were on the bus to Housesteads. By about 10.15, we started walking. It was wild and open and deserted and lovely. 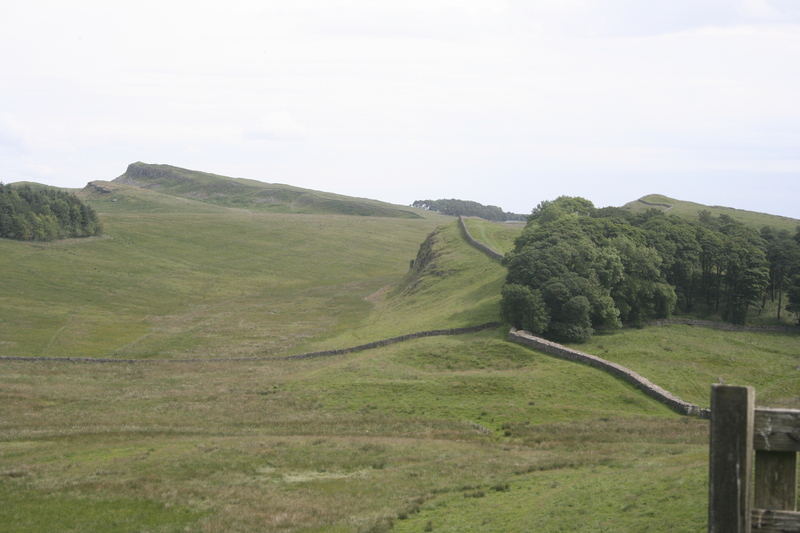 We walked – and in many places stumbled – along the wall for a couple of hours, making excellent progress till we met a family with a different map, who gaily informed us that we were going in the wrong direction. As usual. Sigh. I’m famous for this. Oh well. We made it to the top of a nearby high point, drank some water and juice, and trudged back. It was too late to start walking towards Roman Vindolanda now, it was already 1 pm, and I think we’d both had enough of the ‘walking the wall’ experience anyway. 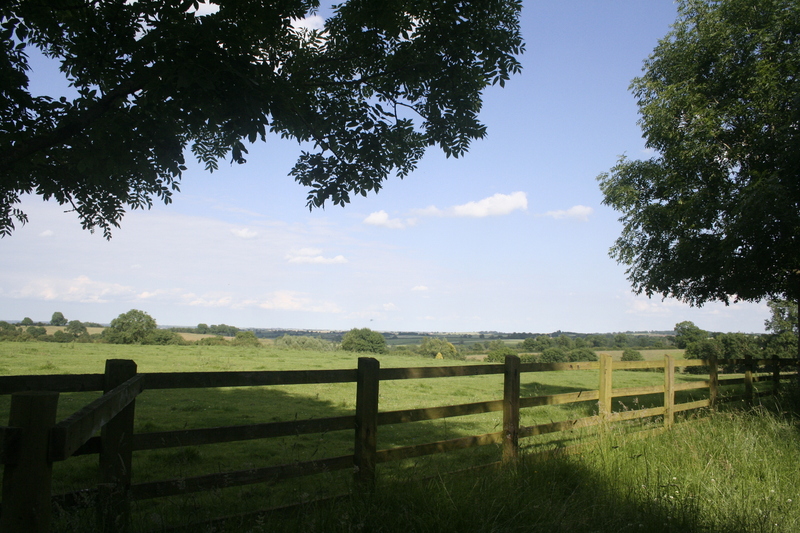 It was lovely countryside, but it was hot and sweaty and in many places there was no path and when there was, there were also notices asking you not to walk on the path but to walk on untrampled grass instead, which was tough going. 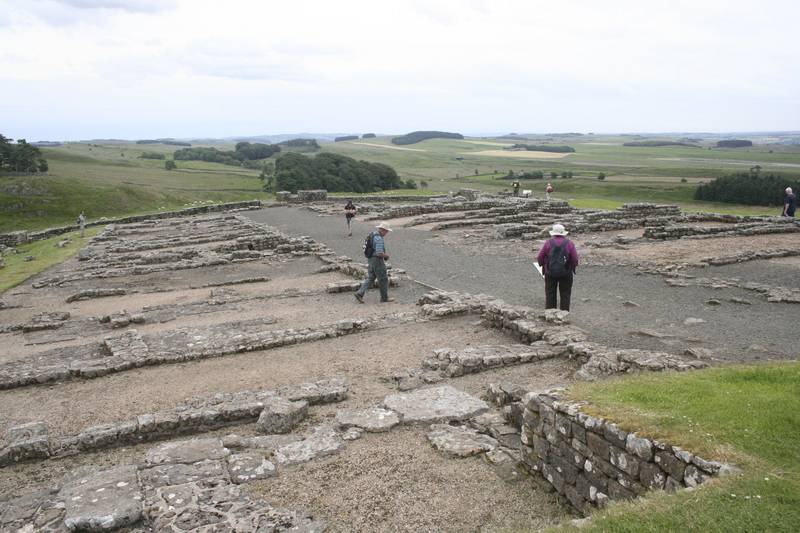 So we spent some time lingering at the Housesteads Roman Fort, then went back to the road and caught the Hadrian’s Wall bus to Roman Vindolanda. Much easier than stumbling over untrampled grass along the wall. 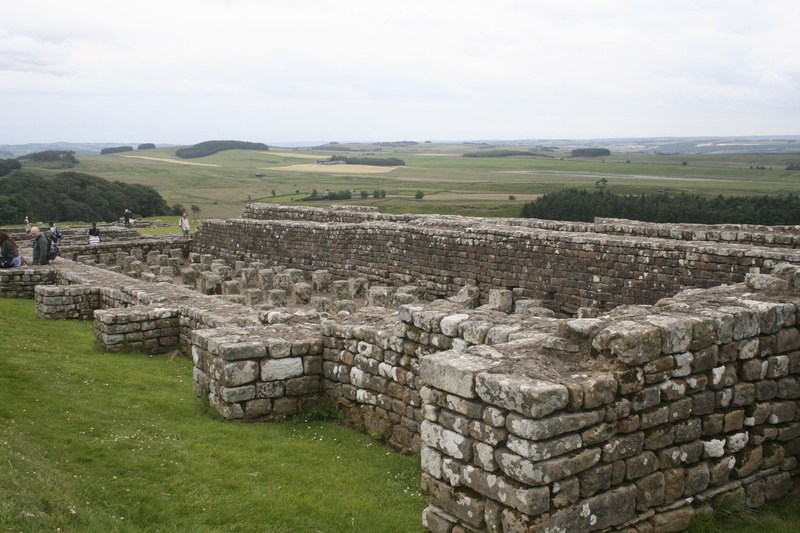 There’s really nothing I can say about either Housesteads or Roman Vindolanda. Both were forts, excavated, unearthed, one might say. Both were lovely in a ruined way. Both had an entry fee of more than 6£, but I loved both places. The rest, the photos will say. 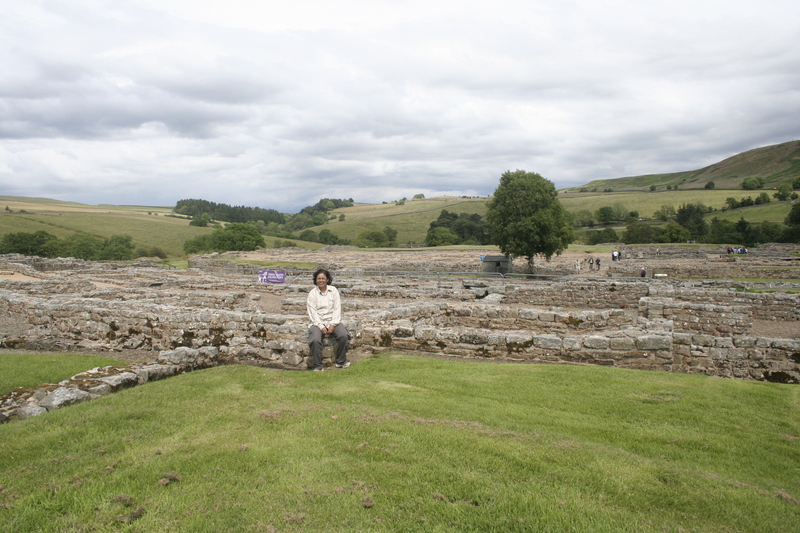 We were done with Roman Vindolanda by about 4 pm and the next bus back to Hexham was due around 5. I suggested that we walk to the next point on the bus route, which was called Once Brewed. I didn’t remember reading much about Once Brewed, but I figured there must be some small thing we could see in half an hour or so and be done by the time the bus came to pick us up. I guess it was not of my brighter ideas. The walk to Once Brewed was fraught with tension as, from the mid point onwards, we both began to wonder whether we were going in the right direction. 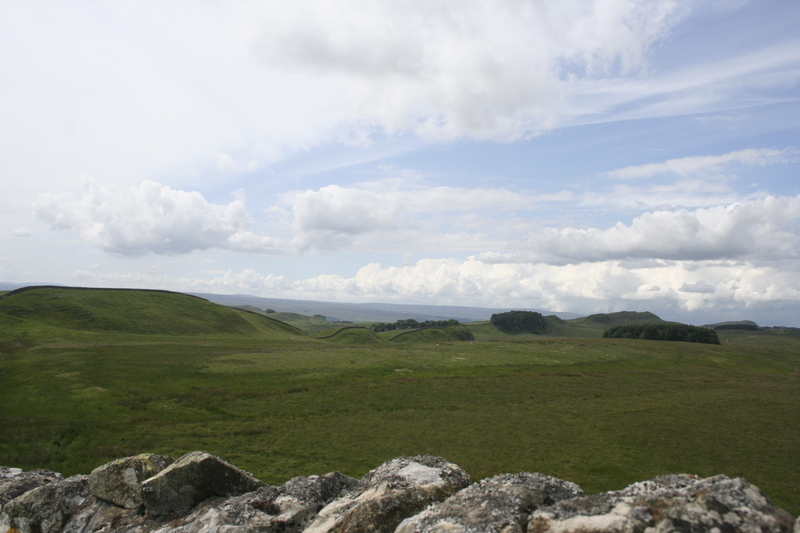 We had a map and we had been pointed in this direction by the folks at Roman Vindolanda, but after 20 minutes of walking when we still couldn’t see any sign of anything except cows… Well, you do start to wonder. Especially if you’ve already taken one wrong turn that day. And, like I said, I’m famous for these going-well-but-in-the-wrong-direction escapades. Of course, this time we were going in the right direction, as confirmed by GPS, a passing cyclist, and the eventual sighting of Once Brewed itself. But, and this is the real crux of the matter, when we finally arrived there at 4.40 tired and footsore, we found out that there really was nothing to see or do over there. It was just a visitor centre. 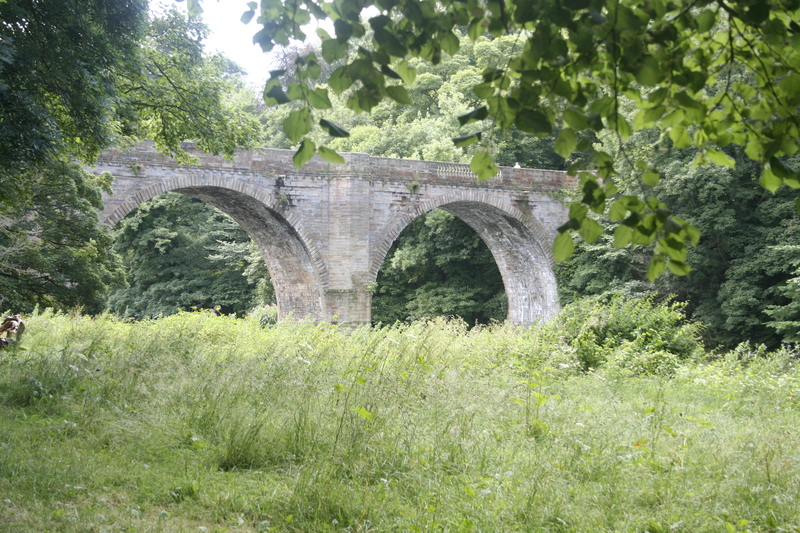 I had a pleasant chat with the woman at the counter and we both used the loo, but it didn’t seem to justify the hot and tiring 40 minutes from Roman Vindolanda, when we could have stayed put and enjoyed the sights there for a while longer. Which is to say, read up before you head out. 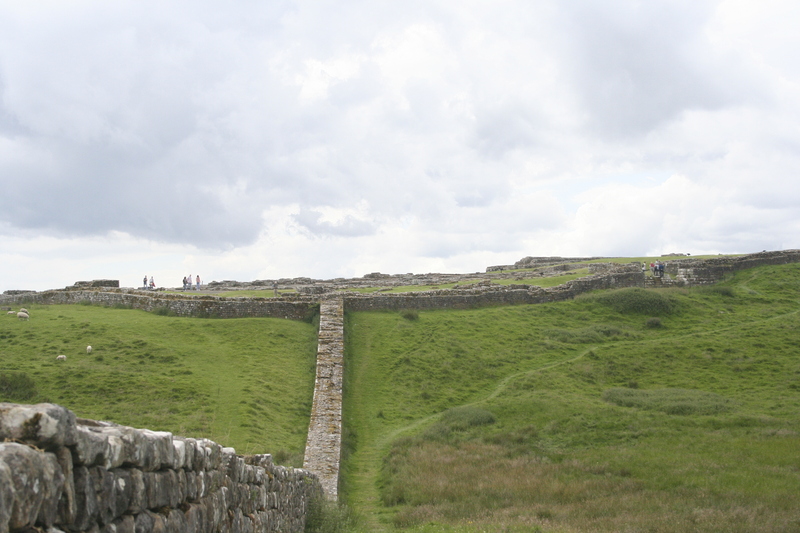 I had survived the Hadrian’s wall outing fortified with nothing more than a banana, an ice cream, and a bit of puffed rice. That evening, we got back to Newcastle determined to stock up on groceries for dinner and the next days breakfast. Like all best laid plans of men and mice, this one promptly went awry. It happened to be Sunday (yes, still!). We’d seen what Saturday meant in England, as we watched an endless mass of humanity parade by, dressed to the nines and determined to party. Now we saw what Sunday meant. There was nobody out on the roads, and every shop was shut up tight. We headed hopefully to Tesco, but even that was closed. The only places open were KFC and McDonalds. And a little kebab place where an Indian man couldn’t understand my request for gluten free food till a local guy interpreted. Strange. At any rate, I feasted on a box of vast quantities of lamb slivers and fat potato chips doused in garlic mayonnaise. The week at Leicester went by the way a work week usually does: slow at the beginning and fast at the end. It was a good experience overall and I certainly learnt a lot. But it was too short and I didn’t learn enough. Also, I don’t jump right into a group of 20 new people and form lasting friendships right away, so just as I was beginning to get comfortable with everyone and figure out who’s who, it was time to say goodbye. On Thursday evening, we had a pub night out, which was a first for me. The conversation was fun, and the beer was ok, but as far as gluten free food goes, my only option was a chicken Caesar salad, which in this pub turned out to be two strips of boiled chicken breast on a few leaves of lettuce with a smudge of mayo on top. 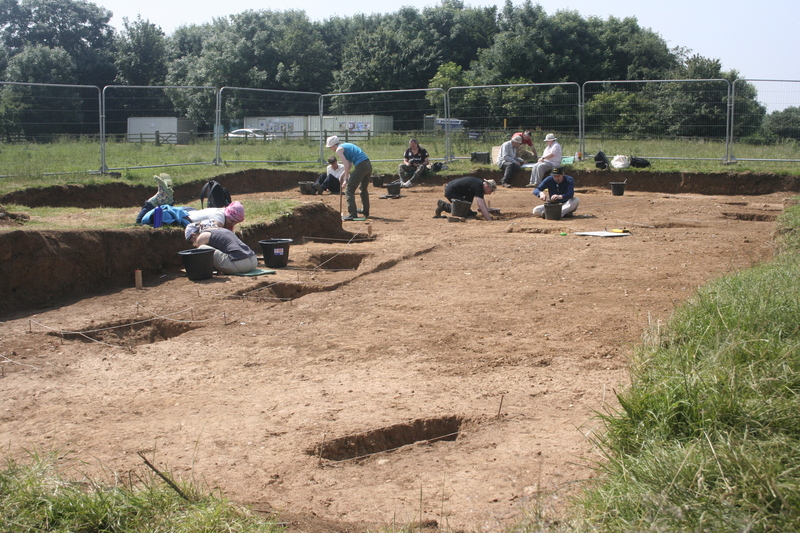 On Friday, after the dig, we got dropped back to the University at the usual time, around 5.30. My bus to London was at 7, which sounds like I had plenty of time, but Maps told me that the coach station was a three mile walk from my B&B and I reached the hostel after sad goodbyes only around 5.45 p.m. I wasted no time in picking up my backpack and leaving, but 3.3 miles in an hour is no easy job for me, especially not with 20 kilos hanging from my shoulders. Still, I made it in 25 minutes. Which only means it wasn’t that far. I think the route I was looking at was from the University, not from the B&B place. Anyway, I reached London and then spent two hours at the London coach station killing time waiting for the coach to Newcastle. It would have been (much) shorter to take a bus or train directly from Leicester to Newcastle, but going through London was (much) cheaper. I met a very nice couple at the bus station who worked in London and went up to Newcastle every weekend, and they helped me to pass the time quite pleasantly. When I reached Newcastle at 6 a.m., it was raining. I trudged to the youth hostel wearily, not having slept much in the bus, and was very thankful that they let me check in. I showered and left immediately to catch the bus to Durham. 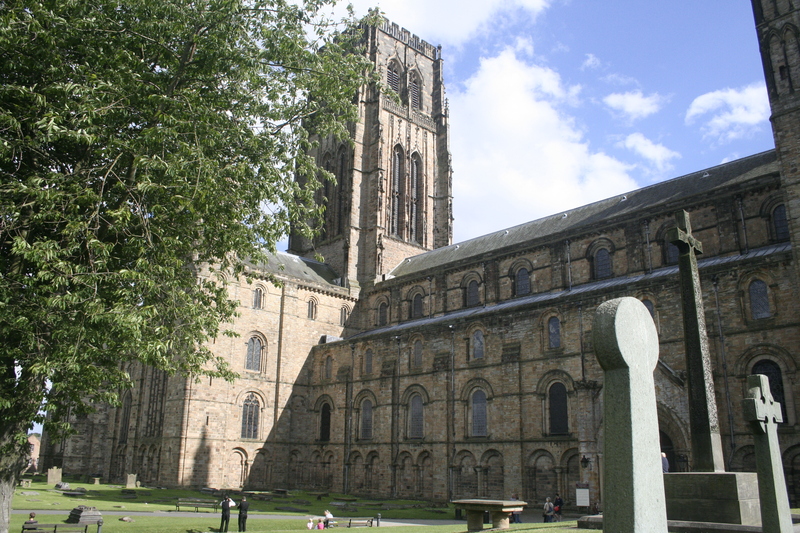 Durham turned out to be a very pleasant little place, quite European in character. I walked up and down and all around and then did it over again. 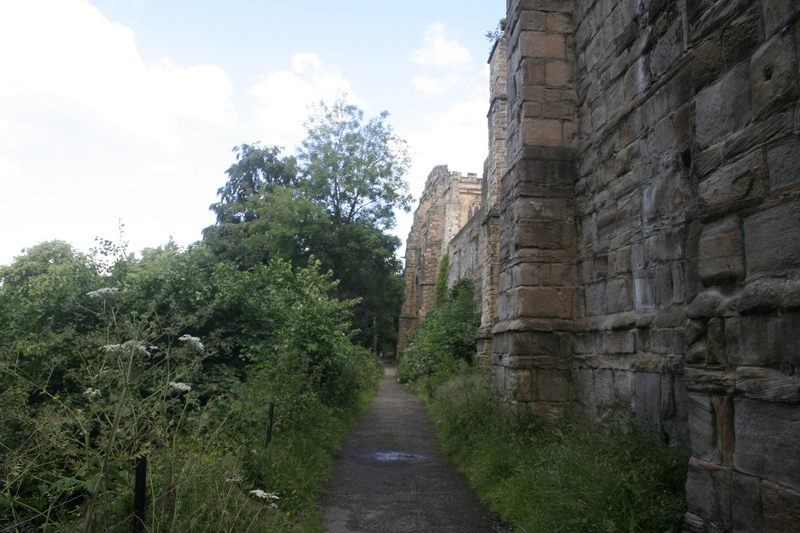 I discovered the shady little path that led around the front of the cathedral, along and above the river. I walked into several bakeries and inquired (with very little hope and even less success) about gluten free food. I ate a burger without the bun and called it lunch and then I ventured into a marketplace and picked up little trinkets for the kids. By this time it was 2 p.m. and my bus back to Newcastle wasn’t till 6.30 p.m., so I spent a very pleasant and lazy afternoon sitting in the sun outside the cathedral. 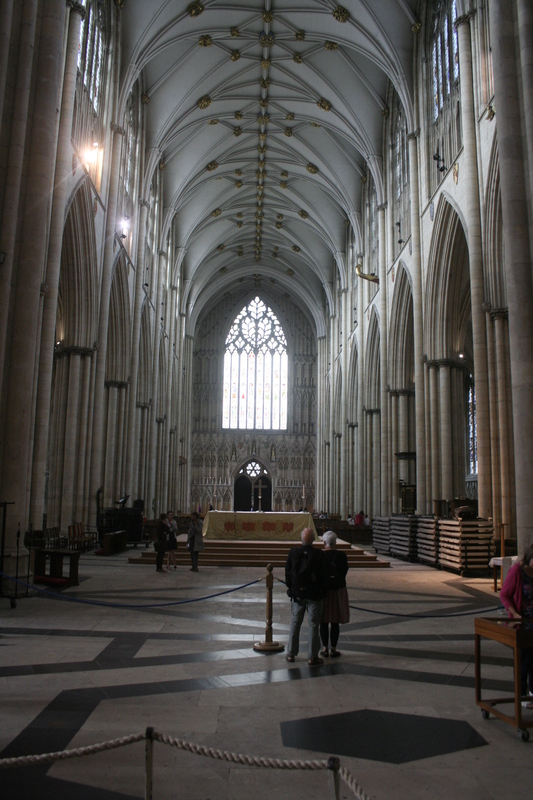 The cathedral was very nice from the outside. I was quite disappointed on venturing inside, because the place had been turned into a fairground of sorts. Well, not quite a fairground, but there was an art exhibition or two, and there were these cutesy little placards, and then there was the musical show by what I presumed was the junior-most choir boys and girls, but instead of being appropriately church-type music, it turned out that they were singing some kind of jazzy pop number, which would have been more appropriate in a kindergarten annual day show than in church. So then I left and went back outside. 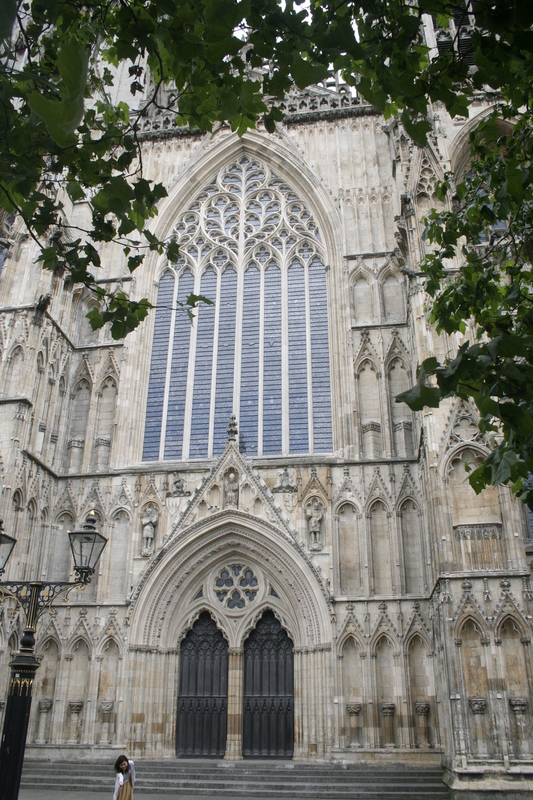 But the outside of the cathedral was very nice. After a bit, the afternoon peace was somewhat shattered by the ringing of the church bells. I remember being privileged to hear this at Notre Dame, where it was absolutely enchanting, riveting, magical, and in short entirely fabulous. Here, it was not quite the same experience. 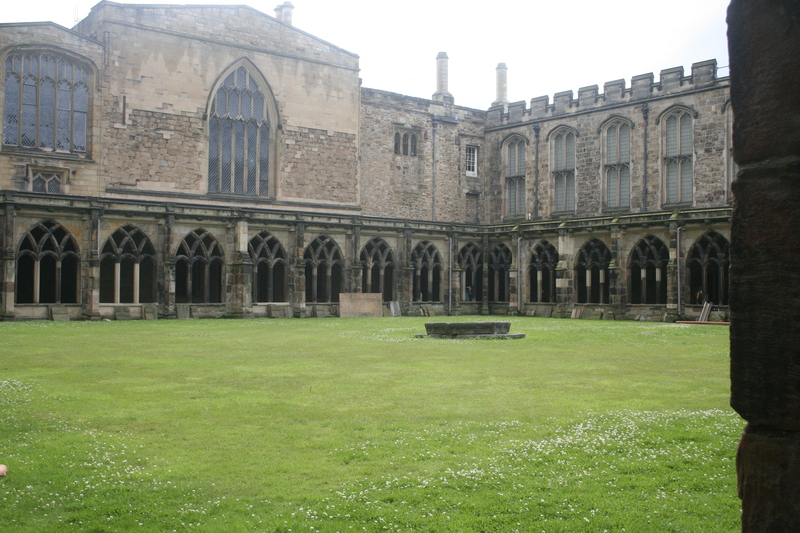 The bells did not have the same amazing resonating boom, and the player appeared to be having his afternoon music lesson (the Durham University School of Music being housed just there). He played uneven scales and a rather random set of notes repetitively for about an hour. I suppose it must be quite an art to play church bells. 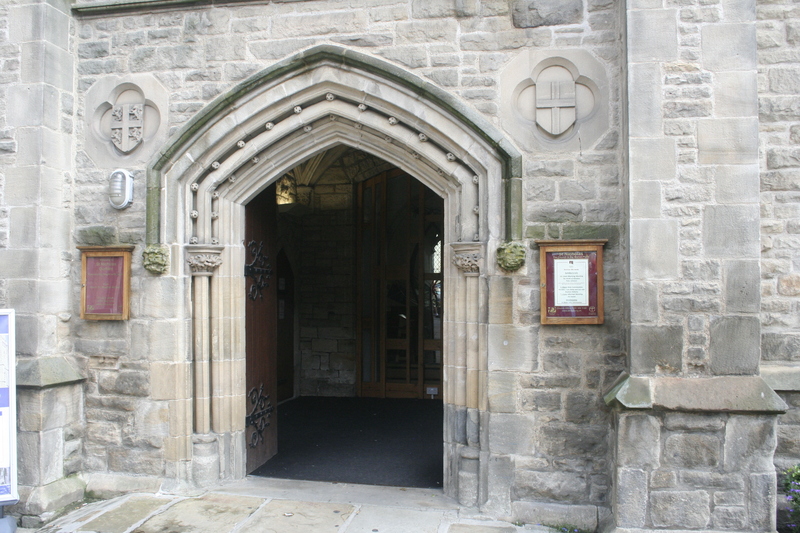 I wanted to go in to Durham Castle too, of course. 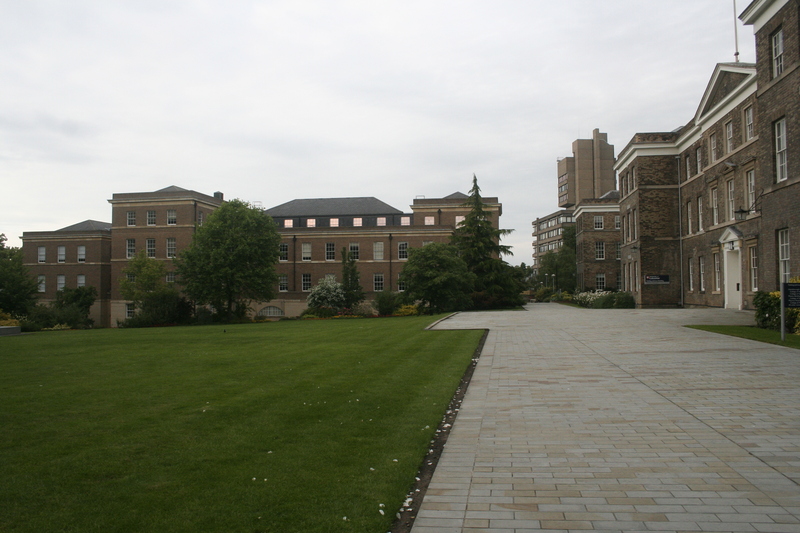 As it happened, it was closed to the public because it was the university open day. 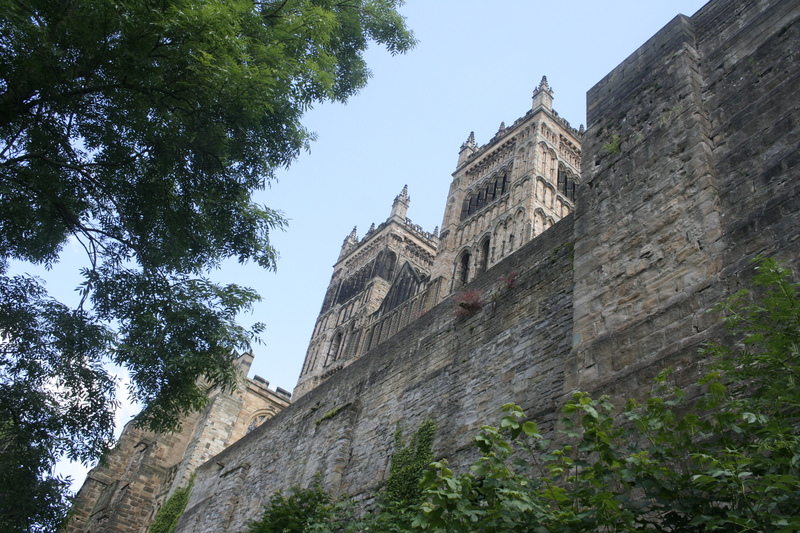 Durham University is in the actual castle building, which I think is just awesome. I mean, who wouldn’t want to go to college in a castle every day? After a day like that, anyone could be forgiven for staying in bed for a while the next day. But, creature of habit that I am, I was awake at 6, and out of bed a little later. The other occupants were still asleep, of course. I crept out and spent a couple of hours relaxing in the dining room. Then I realised that if I wanted to get anything done, I’d better get going. I had an 11.30 bus to catch at Victoria Coach Station, and of course I didn’t know where that was or how to get there. 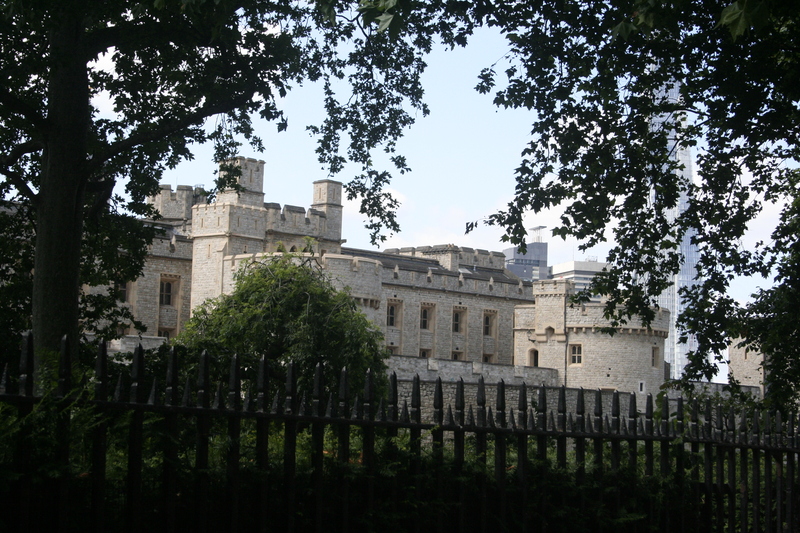 All the same, I thought I would sneak in a quick trip to the Tower of London on the way. It wasn’t on the way at all, as it happens, but when you’re in the Tube, the only difference that it makes is the debit on your Oyster card, which was significant. 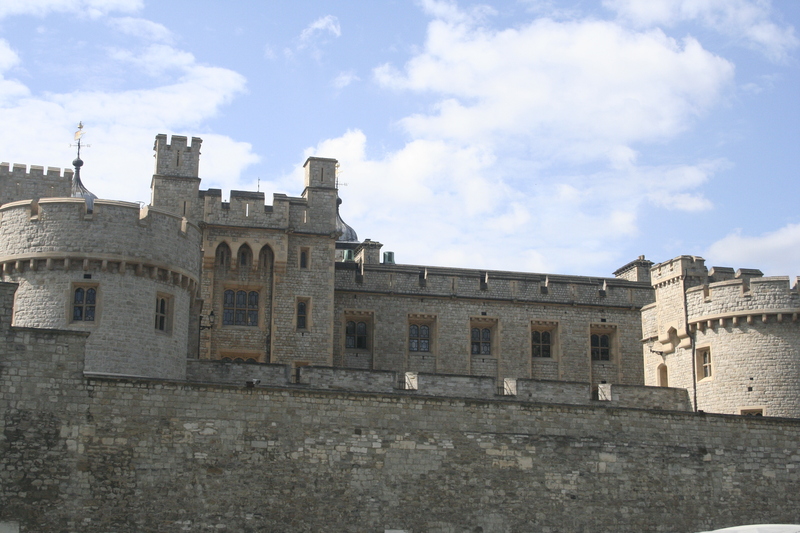 Still, I went to the Tower of London anyway, and as soon as I clapped eyes on it, I was so glad I’d made the effort. It was beautiful, lovely, gorgeous, fairy tale and all those things that I’d expected Buckingham palace to be. It wasn’t horror inspiring at all. I didn’t go in, though I know there’s a lot to see. I didn’t have time, it wasn’t open, and it was 22 GBP for adults, which was much too much to even consider spending at this stage. I find that money decreases in value towards the end of the trip, as your last opportunity for sightseeing draws nearer. After all, you’re going to keep on earning when you get back home the next day, but who knows when (or if) you’ll ever find (or make) the opportunity to come back here. And by then the traveler’s philosophy has firmly taken hold: There’s no point spending so much and coming so far if you’re not going to spend the last 22 bucks that will take you in to actually see the sights you came halfway across the world to see. But this was still early days, when you convert every pound to INR and shudder at the thought; days when you have days and days ahead of you in an unbroken stretch, and very little idea of how far your meager funds will take you. So a 22 GBP entry fee was prohibitive at this stage, and in any case I had no time. “But if I have time when I pass through London later in this trip, I’ll give in and spend the money,” I promised myself. I eventually found the coach station, which was nothing like the bus stands we have in India. There was actually a building with multiple gates, more like an airport, with flat screen displays everywhere telling you which gate you should go to for which destination. I got on to the right bus and reached Leicester bang on time. It was raining. The map, GPS this time, said it was over three miles to my B&B (bed and breakfast to the uninitiated) and would take about an hour to walk. I’d already carried my luggage around for two whole hours in London and didn’t fancy a one hour walk in the rain with my luggage hanging from my shoulders. But I also didn’t want to spend time figuring out the local bus system. So I walked. Leicester is quite different from the posh area of London that I’d seen so far. It’s smaller, poorer, more down to earth in the kind of shops you see. Fewer people walking. On a Sunday afternoon, you’d expect people to be out and about, the light drizzle notwithstanding, but I barely saw half a dozen people in the long walk to my B&B. Not much evidence of public transport either. I’d almost reached, when I glanced at my watch and realised that it wasn’t there. The watch, I mean. It must have fallen off. It did have a tendency for the clasp to come open. Weighed down by my luggage and even more so by the rain, I just couldn’t face the prospect of walking all the way back looking for it. So I dejectedly came to the conclusion that it was good and gone, and continued toward the B&B. But, immediately after I’d checked in, I left to look for it. It was a wedding gift from my paternal grandmother, how could I just give up on it like that? In India, the chances of finding it would have been so remote as to render the effort not worthwhile. But here it was different. There weren’t so many people around and very few obviously poor people. Even if someone saw it, they might not bother to pick it up, I thought. So I went out looking for it. And, sure enough, I found it! I had stopped at a bus stop to take off my jacket at one point. It must have fallen off at that time and was lying quietly on the ground. No one had taken it and no one had stepped on it. I picked it up, tenderly wiped the dust from its face, and tucked it safely into one of the many pockets of my cargo pants. This particular pocket was tiny and closed with a zip. I rarely used it for anything. My watch would be safe enough there. I spent some time in my room, relaxing and sorting out my stuff. It was a cozy little single room, a small single bed, a mantelpiece above, a chair, a small single cupboard, a wash basin, a tiny television (which I didn’t turn on even once) and a light that I almost never needed to use. Jammed in between the cupboard and sink and behind the chair, was a window with a window sill. It wasn’t broad enough to sit on, but it offered a narrow shelf which was invaluable for keeping stuff on, and it allowed in all the natural light one could possibly need. It was, on the whole, quite a lovely room. After I’d spent some time indoors, naturally I grew restless. It had stopped raining, which seemed like enough of a reason for another foray outdoors. I headed for the university, where I would have to report the next day for my course. When I was done wandering around the university buildings and imagining what it would have been like to actually study there, I noticed a small, rather quaint little building across the road from the university campus. It was the Chaplaincy, it said. I initially had the term confused with something like chancellors residence. It was as I was walking past a tiny cemetery that it struck me that a chaplaincy was a sort of church. So then it might be open to the public, something that a vice chancellors residence was unlikely to be. I decided to check. Well, it turned out to be locked, but as I walked away from the little building, I noticed a tiny gate into the cemetery, which stood open. Without pausing to think about it, I walked in. The first few tombstones gave the date of death as 1900 or thereabouts. The path was damp and muddy, the graveyard completely overgrown. It looked as if nobody had been buried here for at least 50 years. Whatever dates I noticed were mostly from the first half of the last century. Some went back to the late 1800s. I’ve actually never been into a cemetery before. I found it strange. It was entirely quiet, but not in the least bit spooky. It was open, still bright of course, very still, and oddly serene. 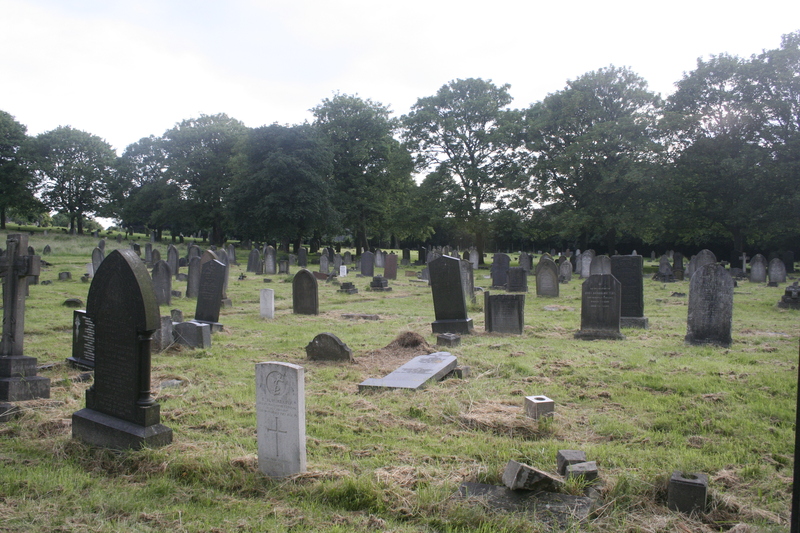 Of course, I couldn’t help thinking of all the dead people resting around me. In my belief system, dead people are just dead, so that didn’t worry me. But it was a bit sad. So many dead souls, so many headstones with the words “in loving memory of” and yet, where was the love and where was the memory now? Many of the tombstones had fallen down. Judging by the undisturbed undergrowth, the unused path and the lack of people and flowers, very few people ever came here anymore. But that was not entirely true. Here and there, there were a few tombstones that were freshly made and the last date at the bottom of those showed an interment as recent as ten years ago. Not entirely unused, then. What was surprising was the extent of the cemetery. From the road, it looked like just a small, cozy little place. But as soon as I started following the path, it led deeper and deeper and deeper into the graveyard and I could see tombstones extending away down the slope in front as well as off to the side as far as the eye could see. A few of the tombstones were extremely ornate. Still forgotten, though. The next day was Monday and the first day of my dig. This was the first dig I’ve ever been on and likely the last as well. The drive to the site, Burrough Hill, was lovely, just absolutely lovely. The drive from London to Leicester had been nice too, but this drive was really, really scenic. At least I thought so. A German colleague found it boring. The countryside sloped up and down in graceful dips and rises covered with lush green grass and dotted with a few sheep and cows. There didn’t seem to be much farming, I wonder why. The drive only took about forty minutes and I would have been happier if it had gone on a bit longer. After the drive, there was a short walk to get to the site. The walk was equally pretty with equally fabulous views. There followed about six hours of digging, with a lunch break at 12.30 and a short tea break at 3. As promised, the site offered neither food, nor water, and no tea or coffee either. There were two toilets – the chemical kind. The digging? Well, it was just digging, somewhat like gardening. I wasn’t very sure about how to identify anything worthwhile and differentiate it from the mud. Others seemed to have more luck with that. In our trench, we unearthed bits of pottery, ash, tiny bits of animal bone, and the highlight of our week was a broken glass bead. None of the excitement came to me. All I got was mud and stone. Carrying lunch to the site was something of a challenge for me. I carried a mix of cold meats, oat cakes (unsweetened), salad, fruit, and yogurt. Most of the salads had a mayonnaise type dressing that contains egg. Luckily, the dressing was packed separately, so I could take it out. Doing so, however, made the salad somewhat less yummy. After a couple of days, I discovered gluten free chocolate biscuits, chocolate mousse, and plain dark chocolate, so after that my evenings were a lot happier. *Well, I really wasn’t in London anymore, what can I say? The Leicester Diary doesn’t have quite the same ring to it. It was 7 pm, and still broad daylight of course. It was broad daylight when I went to sleep at 10 and broad daylight when I woke up at 6-ish the next morning. Of course I’ve experienced days that never seem to darken in previous trips to Europe as well, but, having lived almost my entire life in India, I’m still not used to a day that never sleeps. I’m not a person who never sleeps, not even occasionally. Quite to the contrary. I’m very regular in my sleep habits. And my body was still on India time, which meant it was after 11 pm, really. And, just to put that in perspective, you should also know that I’d left home around 6 pm on Friday and now it was Saturday. True, I’d had a seven-hour layover in Mumbai, but that’s really not as undisturbed as it sounds. First, my flight left an hour late, so that full-night’s-sleep layover got truncated to six hours before I’d even started. Which was good, because it meant that I got an extra hour with the family, which we spent at a McDonald’s near the airport. Not that Mac-Dees is our favourite fast food joint, or even close – but the day had been as rushed as all departure days are, and it was nice to get a brief time to just sit, chat, and not have to – or not be able to – rush around throwing last minute things into my bags. So I got up, drank water, put on my emergency t-shirt (for in case my luggage didn’t reach when I did), ate a well-past-midnight meal, and wandered around till I couldn’t walk anymore. Then, around 4 a.m. I settled down to read. And, of course, promptly fell asleep. Thankfully, my tennis alarm woke me up faithfully at 5.15, or this story might have ended here. From that point, it was merely a matter of staying awake till boarding time. I snoozed a bit on the nine-hour flight and watched two movies (Life of Pi and The Grand Budapest) and downed two servings of red wine and then we landed. It was never really on my agenda to see London before I die, but now, believe it or not, here I was. I got (or rather, stumbled) through all the rigmarole of changing currency, buying a SIM card, and finding my way via the tube to the youth hostel. The wrong one, of course; there are two in central London. I had made a detailed itinerary that told me exactly where I was supposed to go and when, but in my sleep-deprived state I had neglected to so much as glance at it, so obviously I landed up at the wrong one and had to trudge all the way back to the other one, which was naturally much closer to the tube station I’d come out from. At any rate, by 4 pm, I’d found my bed, showered, and was ready to start exploring. And by 7 pm, I was ready to drop. But… How? London beckoned. My youth hostel was in Oxford Street, possibly the poshest area in London and therefore entirely inappropriate for backpacking tourists. Nevertheless, I immersed myself in the stream of posh Londoners and hip tourists and allowed the tide to carry me along, unwieldy and uncool as I was in my ancient cargo pants and bulky camera bag. There was a light rain falling, which meant juggling an umbrella along with a map. Yes, paper maps are still used. I was handed two, one by each hostel. And they served me well, not being subject to the vagaries of network connections as the other kind of maps are. Buckingham Palace first, of course. I had a very short shortlist of places I wanted to see in London. There is much too much in that mother of all cities to see in half a day, so I selected stuff that was nearby and well known. 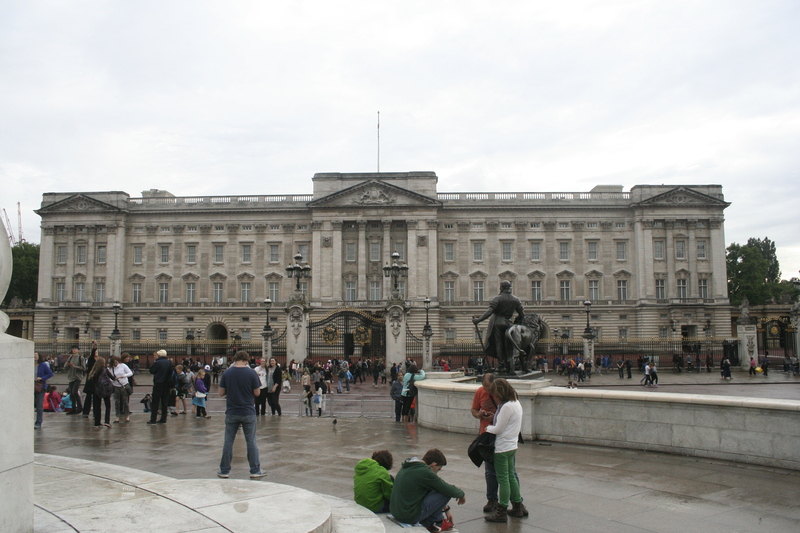 Hyde Park was on the list, but Buckingham Palace was higher. There was a road called Queen’s Walk, which sounded evocative, so I found my way to it, wandering past Sotheby’s and Tiffany and coming upon the meeting point of Old Bond Street and New Bond Street in the process and feeling rather Alice-in-wonderland-ish about it all. It was just starting to sink in that I was actually in London after all. 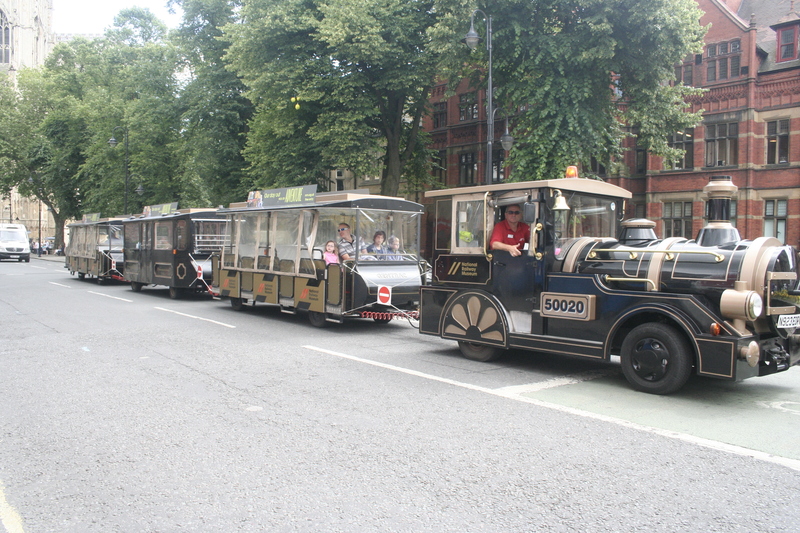 Queen’s Walk was just a road through a park – green and pleasant, not spectacular. At the end of the road was Buckingham Palace. It was a bit of a so-what experience, actually. A square box of a building, with those funny guards standing outside. Tall gates you couldn’t go through. It really wasn’t very impressive at all. Or maybe that was just the sleep deprivation showing up. It could be. Time to go home. I walked along St James’ Park, intending to take a slightly different route back, when I spotted Westminster Abbey on the map. Naturally, all by themselves my feet turned in that direction. So what if it was about 30 hours since my last full night’s sleep. One doesn’t come to walking distance of Westminster Abbey and then turn away just to get some sleep. And thank goodness for that. Westminster Abbey was beautiful. Not only that, the Houses of Parliament also just took my breath away. 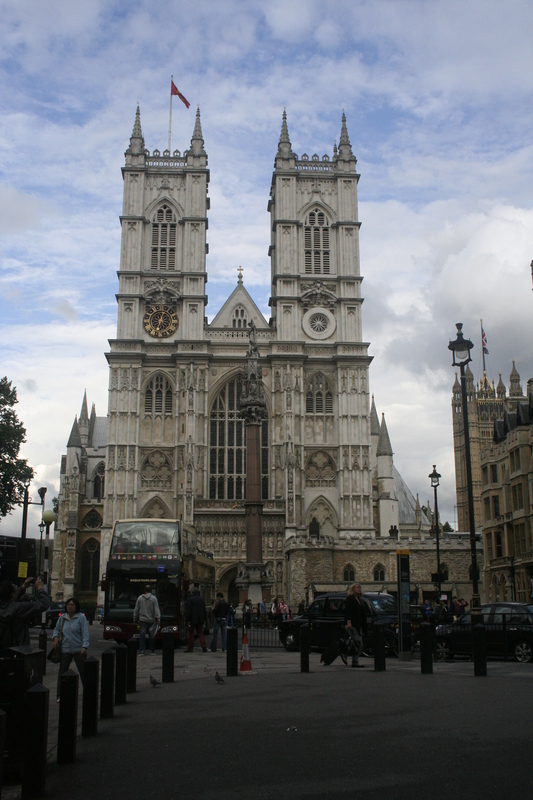 With Westminster Abbey, I hadn’t known what to expect, but I expected something. The Houses of Parliament though, I hadn’t given them a second thought. They weren’t even on my list of things to see. How could they possibly be so lovely? 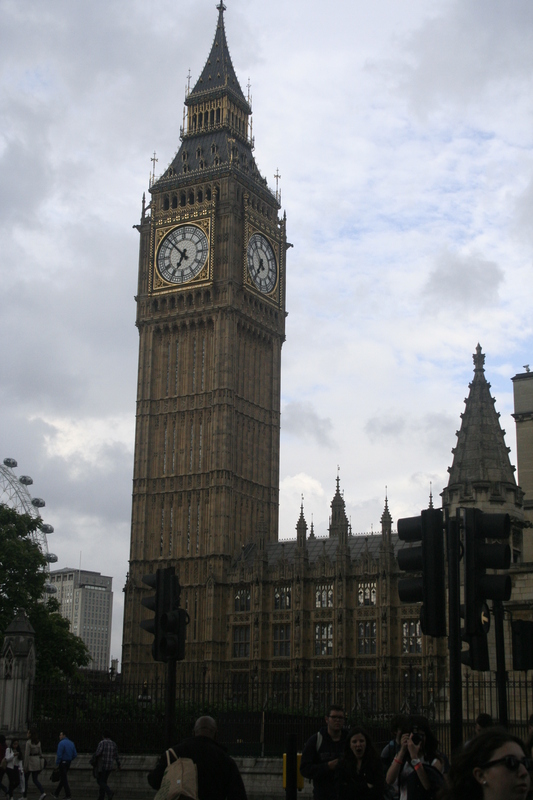 And then there was Big Ben, which was nice too. I walked up to the river and gazed across its dirty grey-green water. And then it really was time to go back to the youth hostel. Dinner, at 9 pm, was cold meat, yogurt, and fruit from Sainsbury. It was 2.30 a.m. India time when I finally lay down. I was in a 4-bed dorm. Others came in while I slept – they must have, because they weren’t there when I lay down and they were there when I woke up the next morning. Did they move around, talk, change, brush? Did they open and close lockers or go out to the bathroom? Did they turn on the lights? Well, they could have lit firecrackers under my bed for all I know. After more than 40 hour with very little sleep, for eight hours straight I was quite quite dead to the world. * Ok, so that’s not a very original title. I also thought of “The London Reporter” or “Roving in London”. And all of them suffer from the sin of inaccuracy in the extreme. 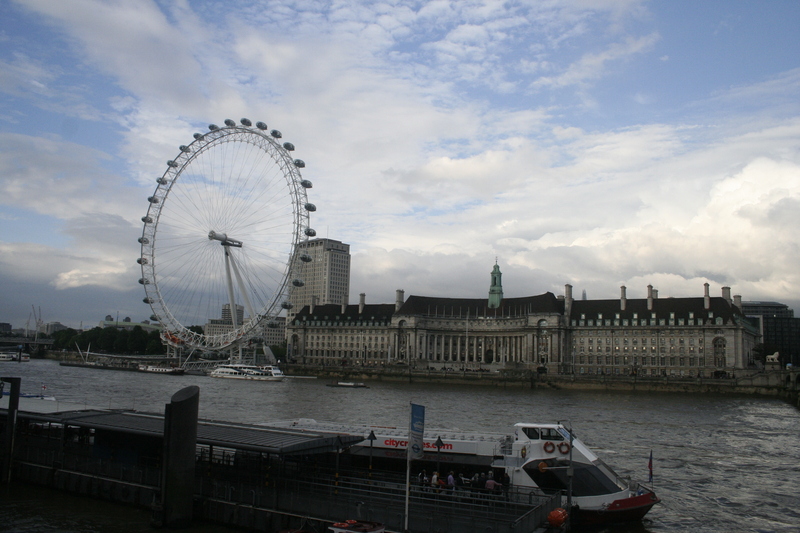 I spent very little time in London. But whatever. 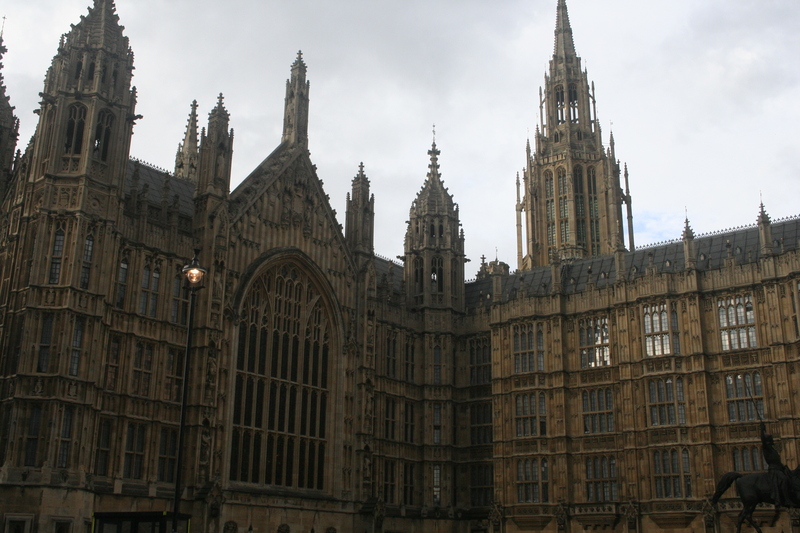 This is part 1 of The London Diary, which is likely to run to six or seven parts. Watch out! You are currently browsing the The Twins & I blog archives for July, 2014.